More than Meets the Eye: An Attack, an Advantage, and a Blunder! 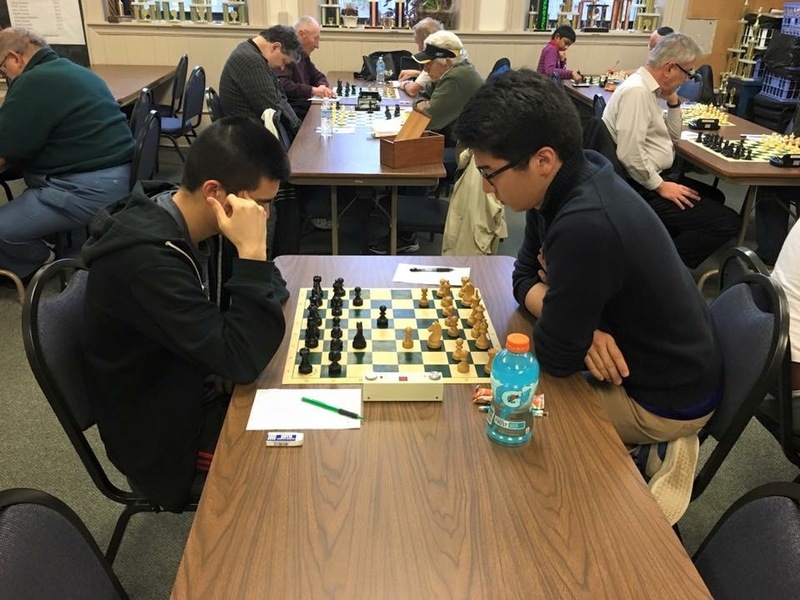 I hadn’t planned to play a rated game until Saturday’s Pittsburgh Chess League finale, but when I got the email saying my Tuesday night class had been canceled, I quickly found myself playing an extra rated game against a local expert from Carnegie Mellon University at the Pittsburgh Chess Club. Usually when I post a game to chess^summit, I make sure the selection has some sort of specific instructional purpose. That being said, I can’t say that this game can be marginalized into such a general category. 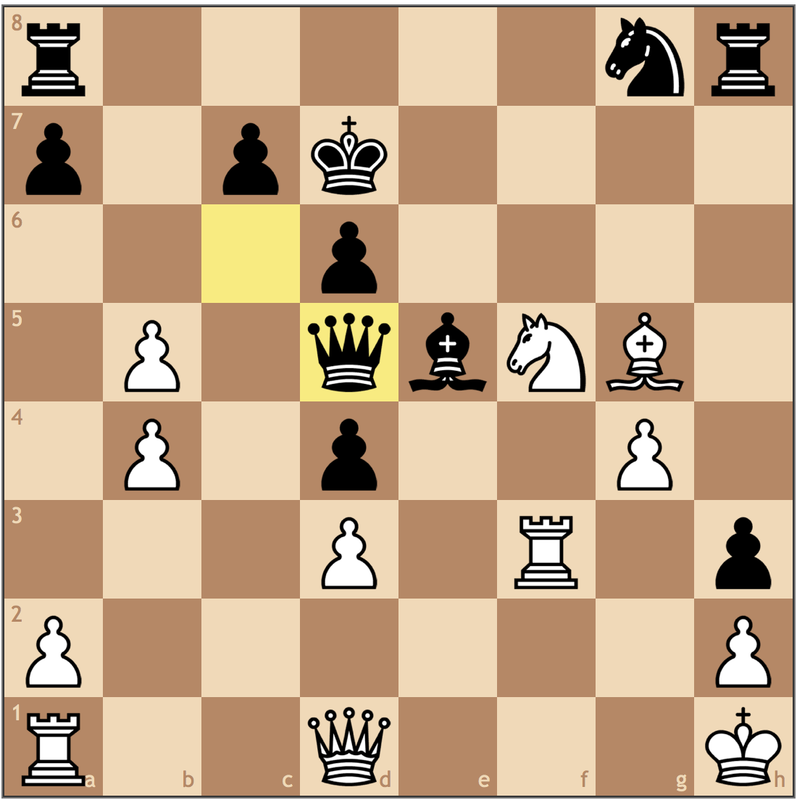 Even though he fell behind early, my opponent did really well to hold and even missed a few chances to equalize! So if today has a theme, let it be complicated positions. Honestly I can’t remember winning a game this difficult (and almost blowing it too!). 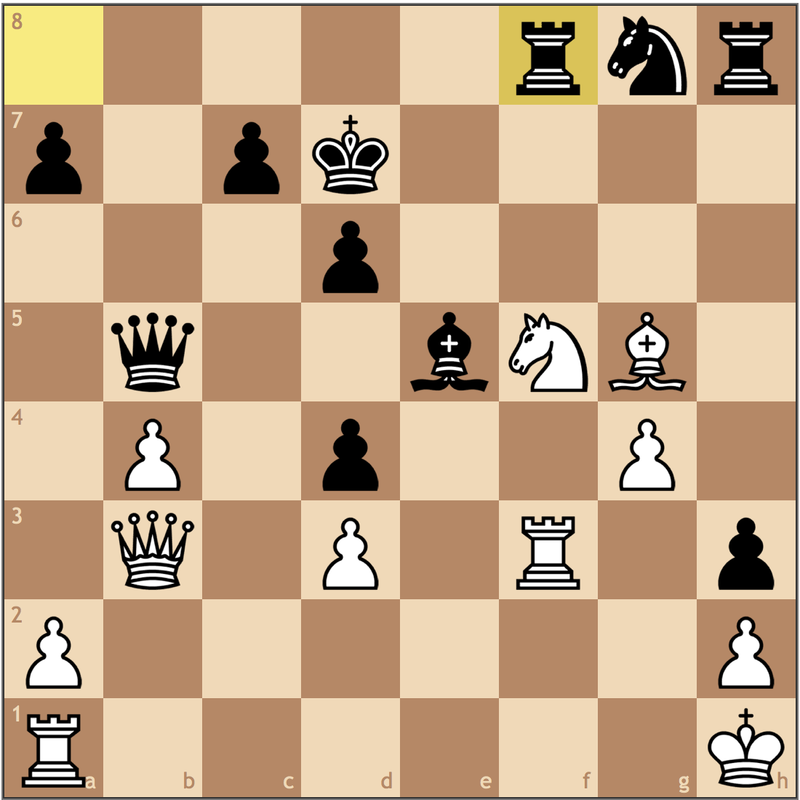 I think I’ve posted a few games with this set-up for White. 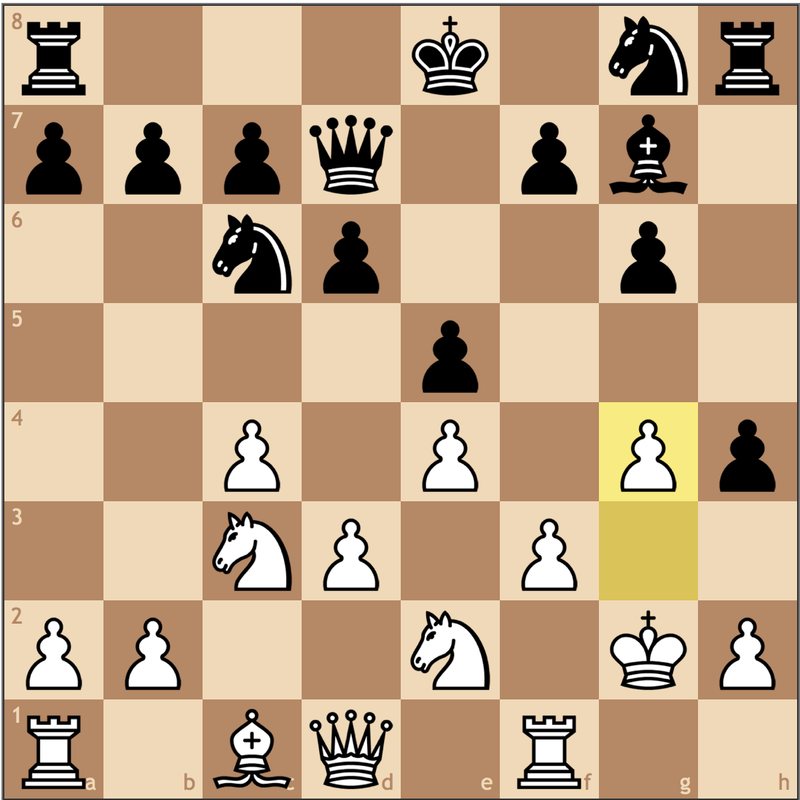 Ideally, I’m going to place a knight on d5 and expand on the queenside. However, my opponent decided to change the pace of the game. Going in for the attack! 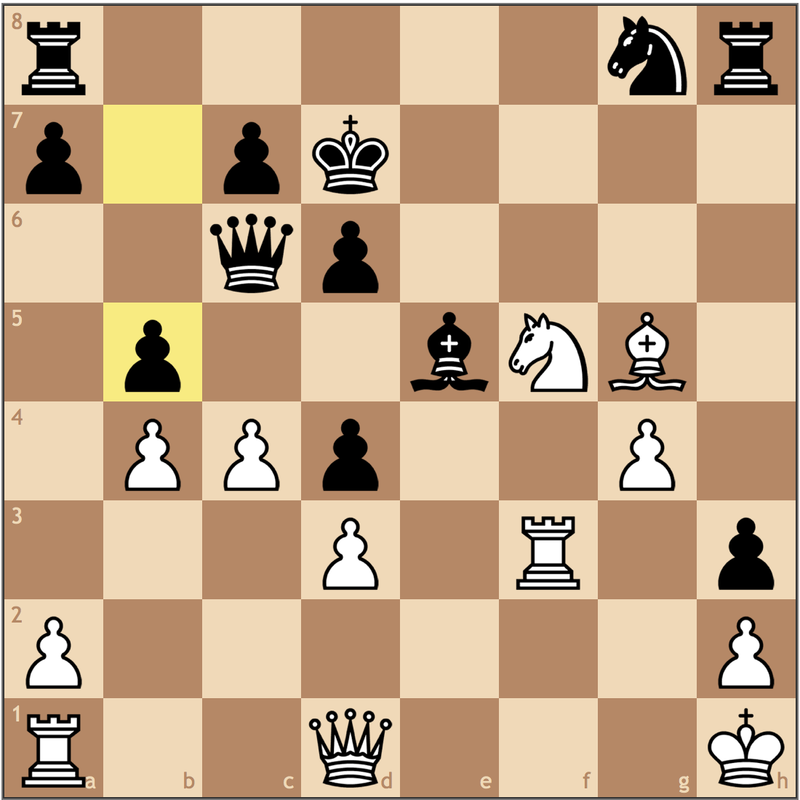 Black’s intention is to open the h-file and use his h8-rook and queen to quickly checkmate my king. However, there are some downsides to this move out of principle. 1. This move doesn’t develop or get Black’s king safe. Okay, this is obvious, but still a valid point. 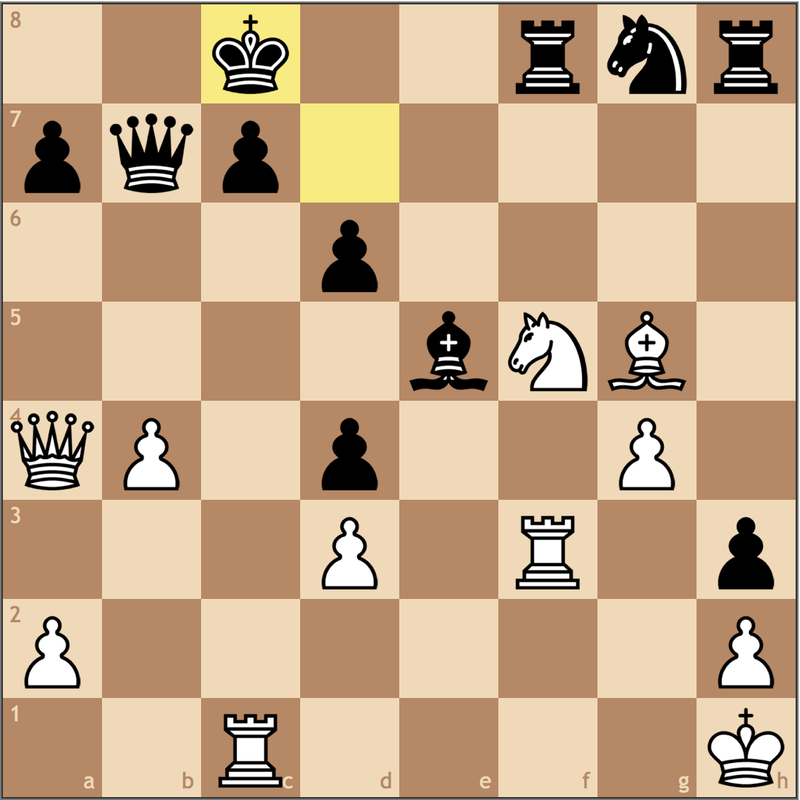 By postponing the fundamentals, Black risks falling behind positionally should the attack not pan out. 2. Black cannot push …f7-f5. This is the main problem with this move. If the f-pawn is pushed, Black gives White an outpost on g5 for a knight or a bishop. Knowing this, I opted for 10. f3, giving me the option of Rf1-f2 if needed. 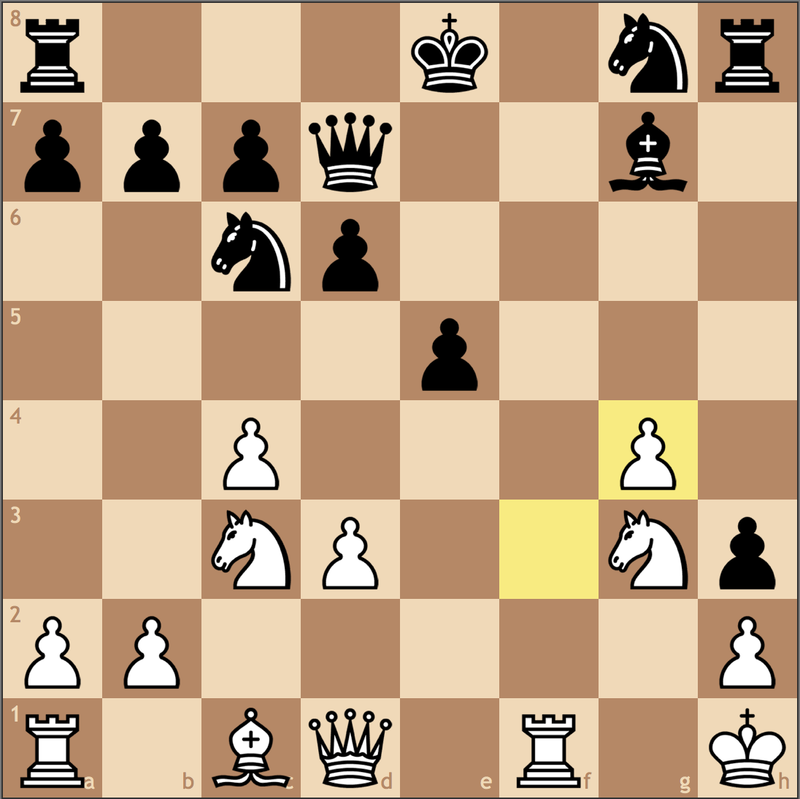 Furthermore, if Black tries …h5-h4, g3-g4 can now shut down the position. Because of Black’s decision to attack, this must be played now. 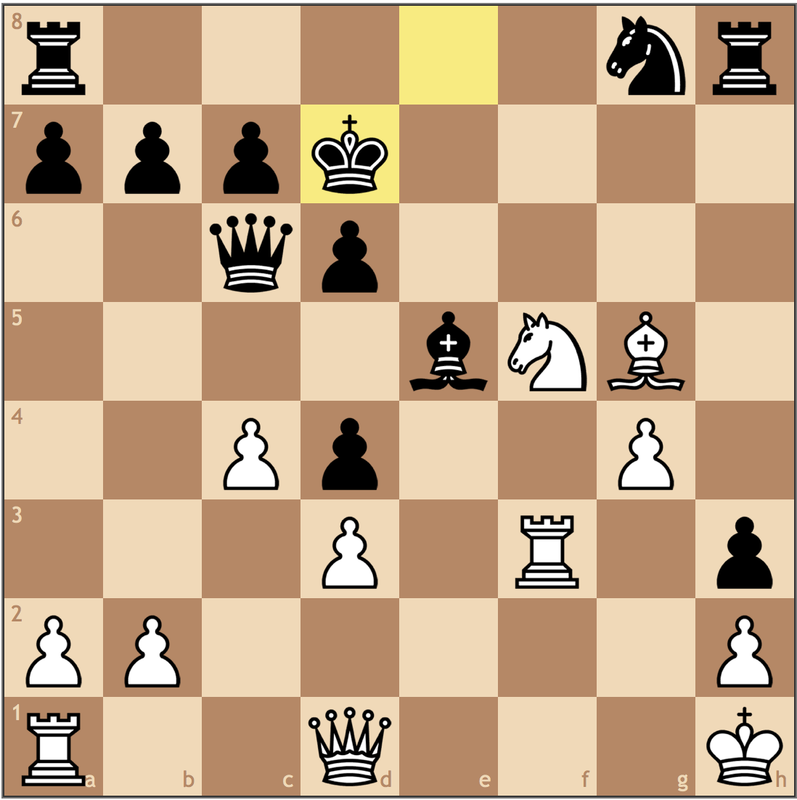 If 11… Nh6 12.h4, White stops all kingside play and has a simple lead in development. Not a move I was crazy about playing, but I was able to convince myself that this was right. First, Black traded off the light squared bishops, leaving the c1- and g7 bishops on the board. 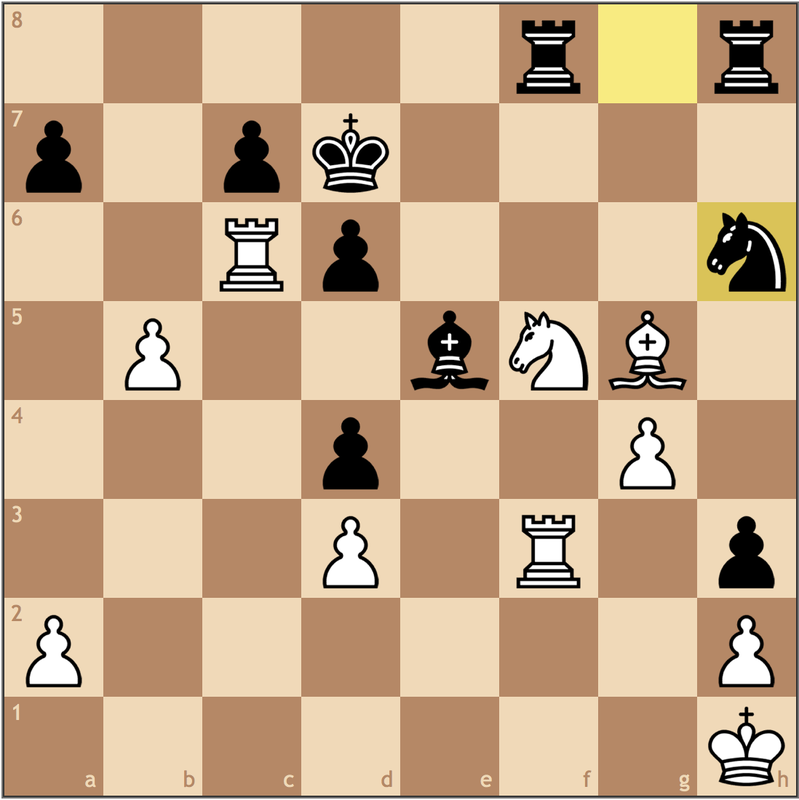 Black’s pawns on c7-d6-e5 are all on dark squares, making my bishop better than my opponent’s. This is important since this structure has dark-squared holes, so from e3, I can cover some of Black’s potential outposts. Furthermore, playing this move guarantees a closed h-file, limiting Black’s intentions, and leaving me with a developmental advantage. My initial reaction to this move was to think that this was an error since it forces my king to safer waters and opens the g3 square for my knight. However, there are long-term benefits for Black! 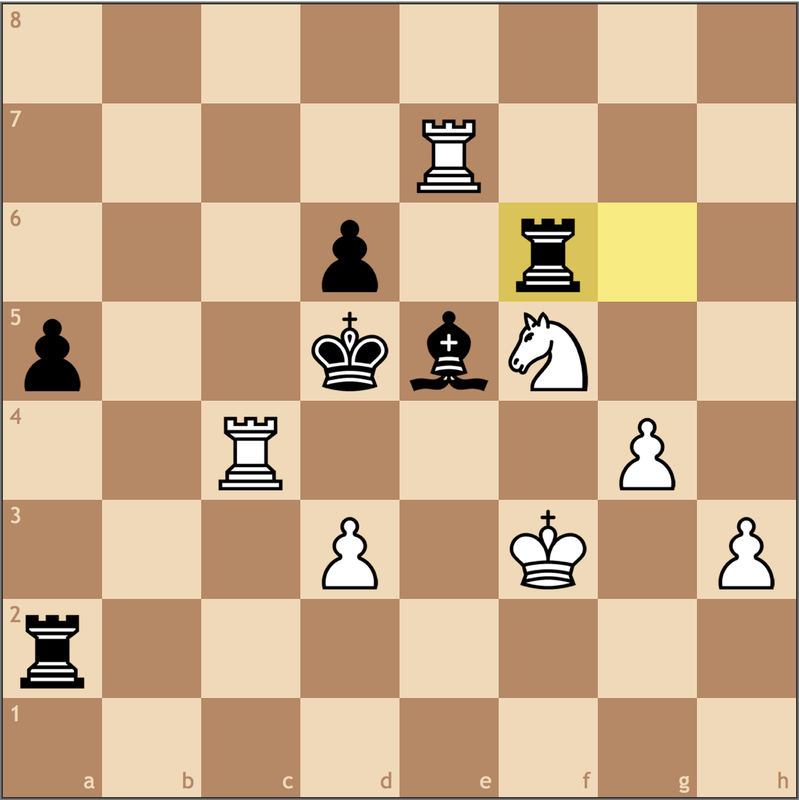 By controlling the g2 square, Black gets the counterplay he needs to stay alive in some lines – and according to the computer – enough to defend adequately. I found myself perplexed by the relative speed to which my opponent was moving, but this move I felt out of principle was wrong. Even if this is tenable, I do feel like Black is getting the play he intended with his opening choice. With the g-file open, Black’s plan is to play … f5-f4 and queenside castle to bring his d8-rook over to g8. This is a lot of pressure, which brings me to my next point. 2. I’m not punishing Black! 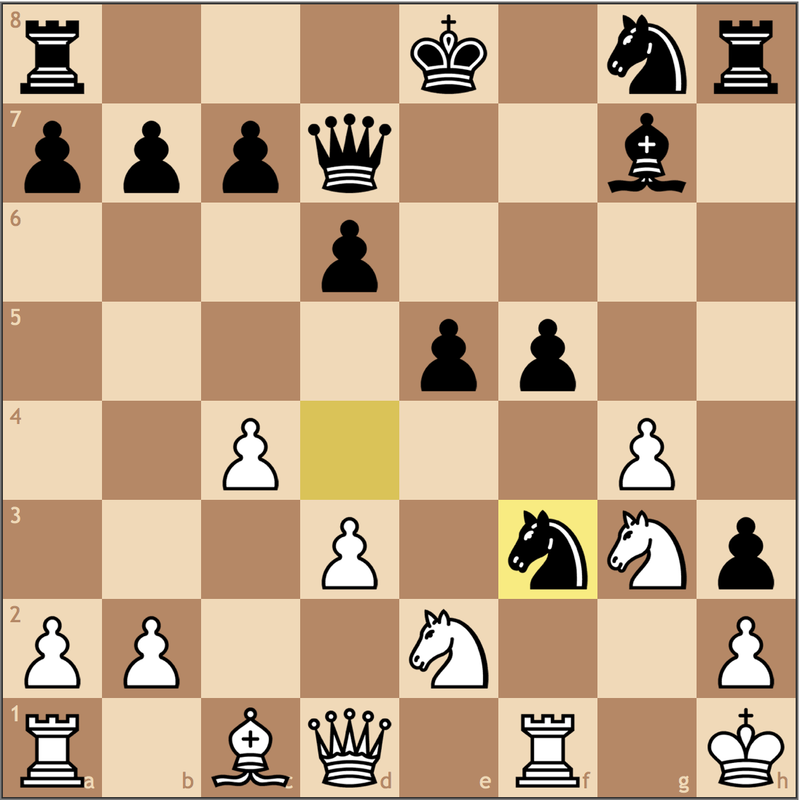 Remember back when Black played 9… h5 when I said my opponent wasn’t following opening principles? 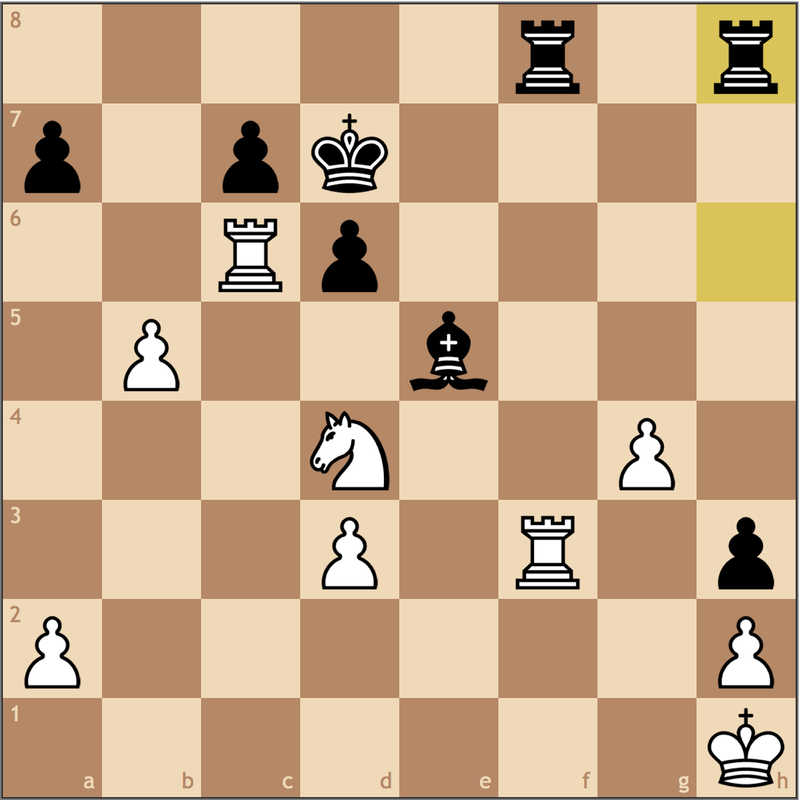 14. gxf5 not only fails to capitalize on this detail, it actually rewards Black for his play! Taking away from the center! But it turns out here that matters aren’t so trivial, Black’s king is still in the center, so opening the e-file with a future f3-f4 or d3-d4 push may be lethal. It was here that I noticed that Black’s weakness wasn’t the square on g5, it was the f5 square! 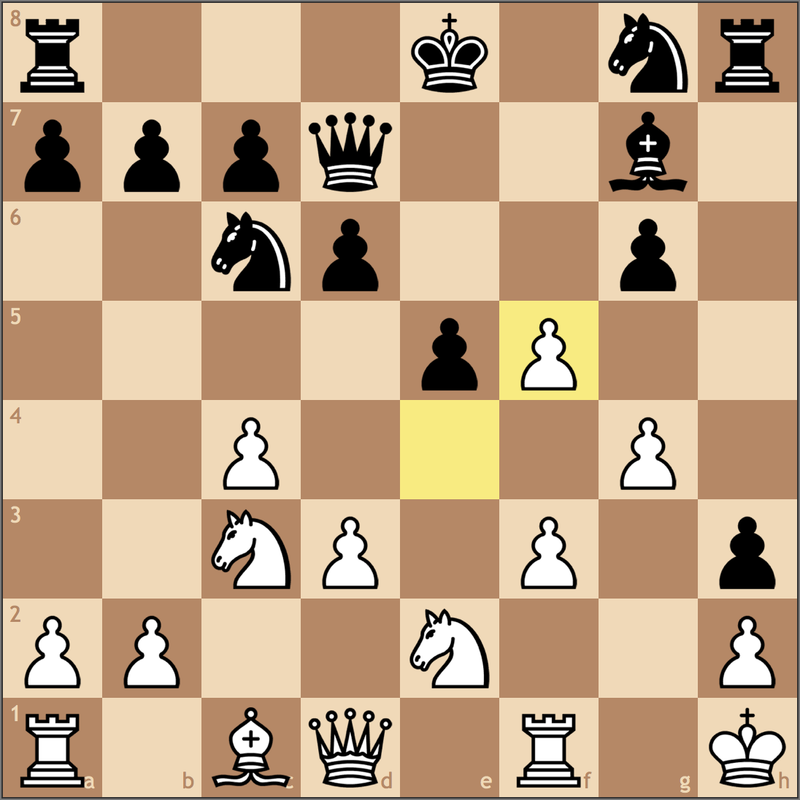 By taking in this manner, the structure has changed; so a pawn on g4 helps support a knight on f5 and close the g-file. 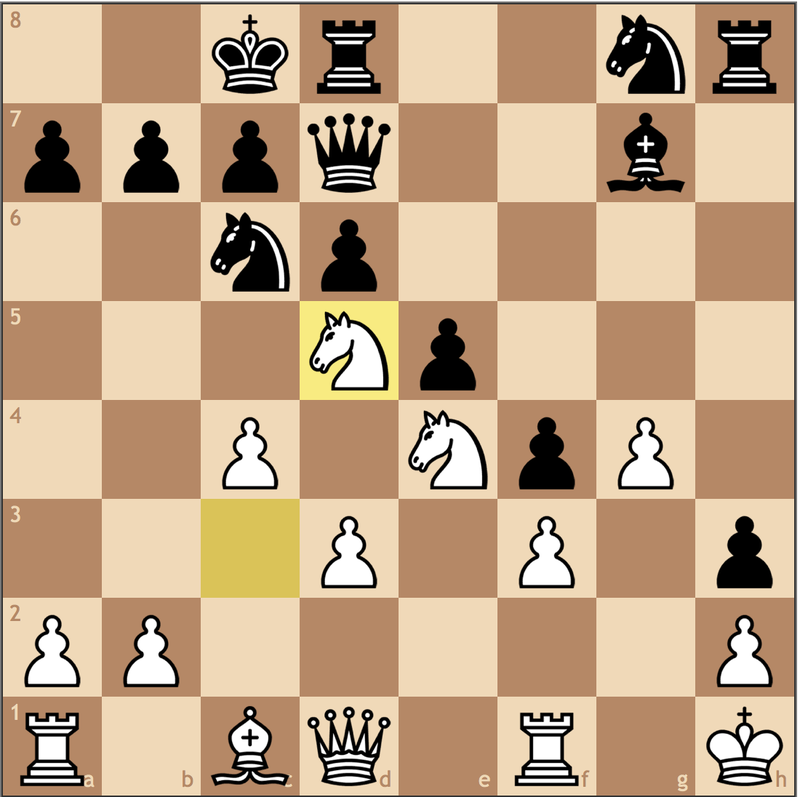 As my knight reroutes to f5, my bishop will find the right moment to go into g5 and cramp Black’s position. And the best part? 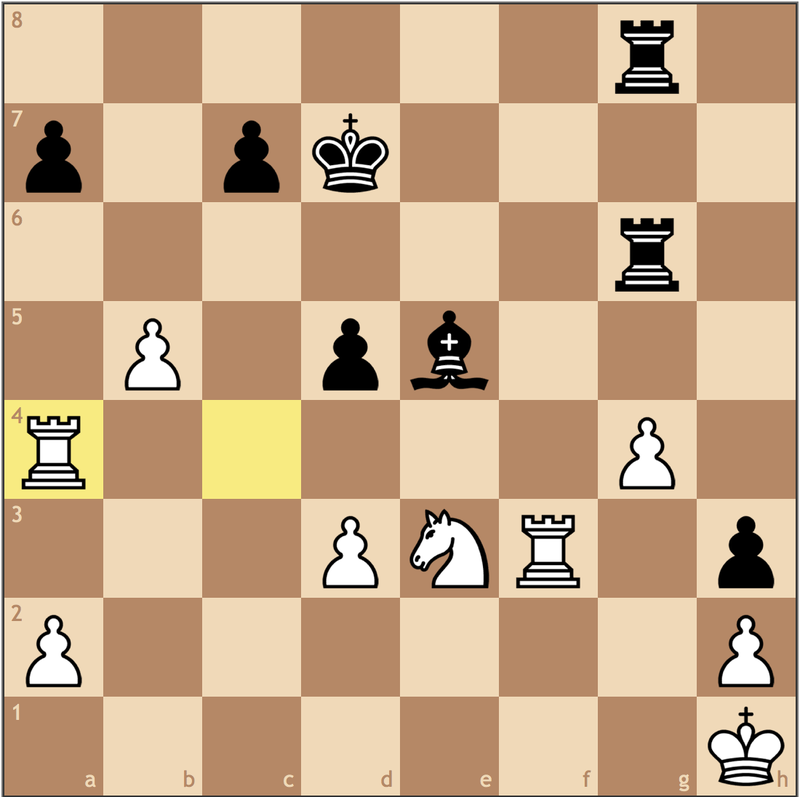 14. exf5 was one of the computer’s best moves! 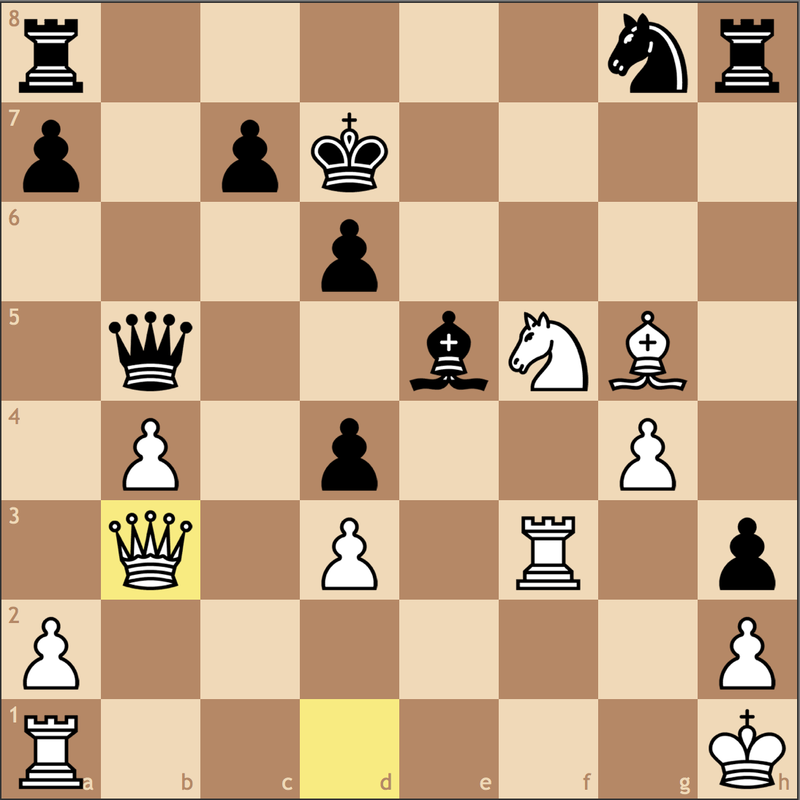 The position is a little unclear here since Black can simplify, but b2-b4 is coming with a slight initiative for White. As I’ve discussed in many of my posts, releasing the tension seldom leads to the best outcome. Here I have all the advantages I had a move ago, but the f-file is also open. It’s clear here that Black has simply run out of attacking resources. 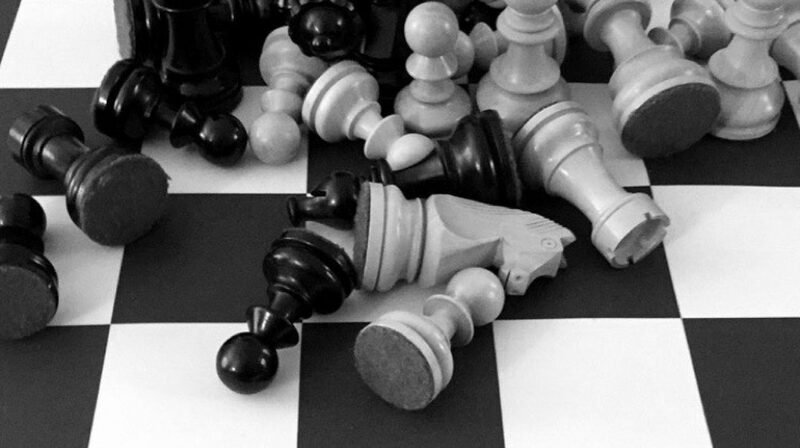 Because of the discovery threats on the queen, castling for Black comes at the cost of a pawn. However, not all captures are forcing! 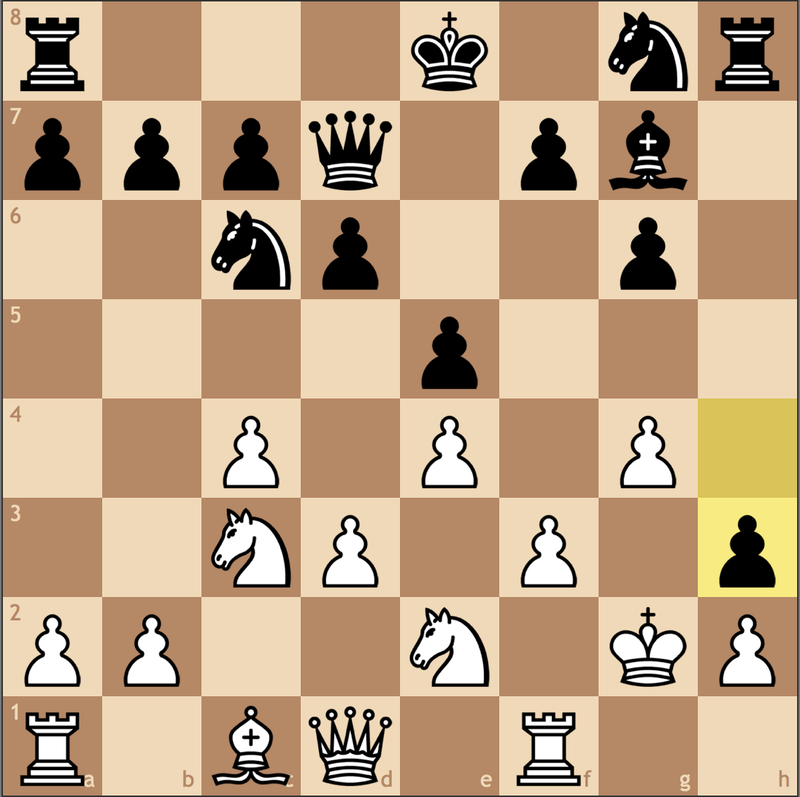 I soon realized that my dystopic outlook on the position was not only incorrect, but potentially losing after Black’s amazing resource, 16… Nh6! This shifts the game from dynamic play to static play. With 16. gxf4? I’ve actually given up any chance of securing the f5 outpost and opened the g-file for Black’s rook. 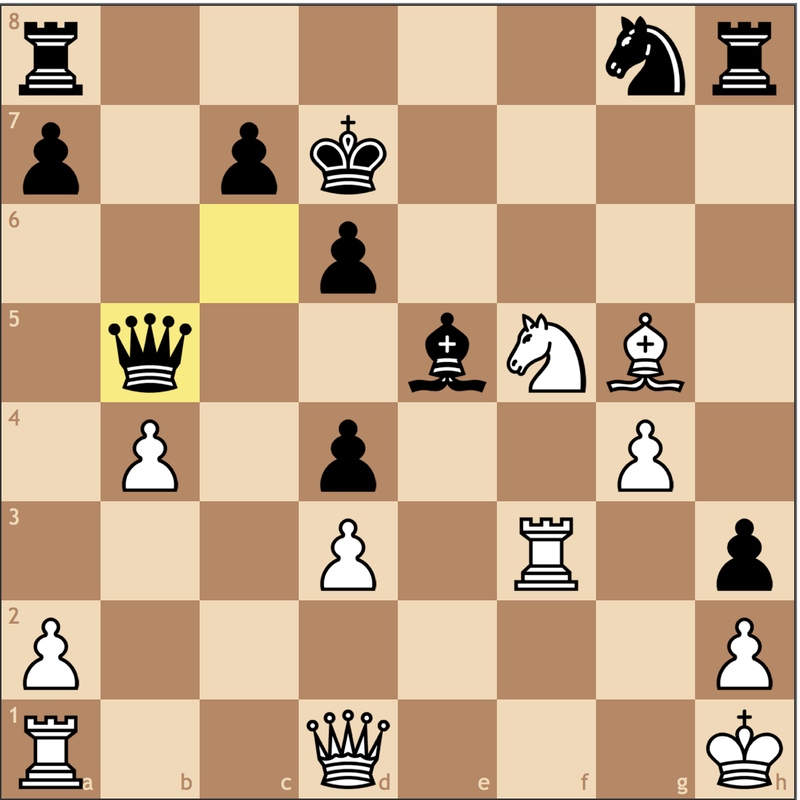 Trying to stop Black from castling with 17. 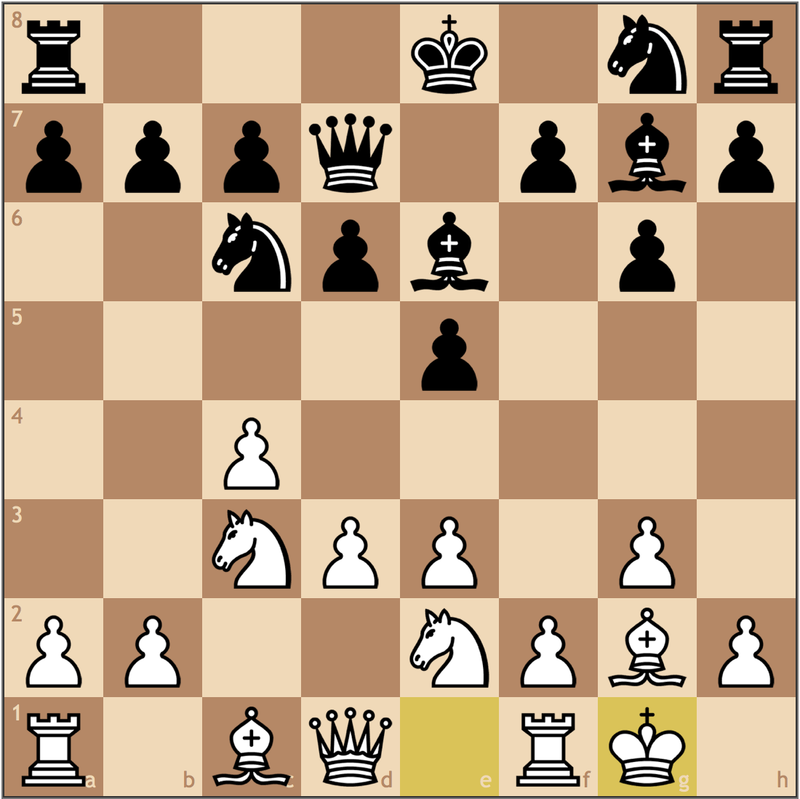 Bg5 still looks grim after 17… Nhxf5 =+. 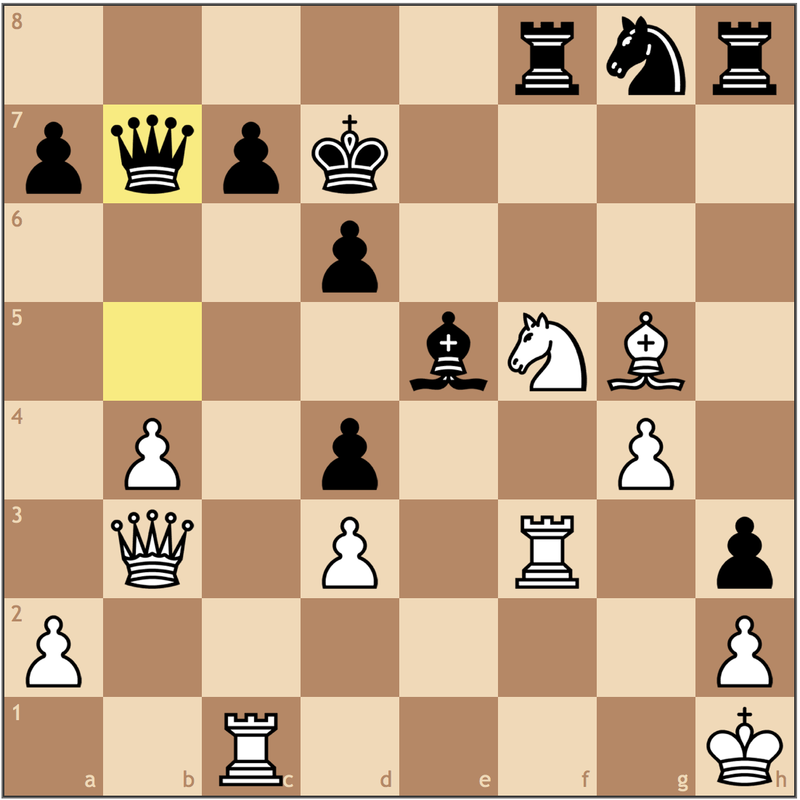 And here it’s clear that Black is simply better with no real counterchances for White. So I had to be less direct, yet still keeping the position in a dynamic state. With my next move, I highlighted that the f5 pawn is still weak. My c3-knight was no longer planning on reaching d5 since Black can play …c7-c6 now, so trading it for Black’s best piece was appealing. Black took drastic measures with his next move, but he had several options to consider. But after some research with Stockfish, here it’s my play that’s burned out, and soon I will find that the g2 pawn is not protecting my king, it’s a protected passed pawn! 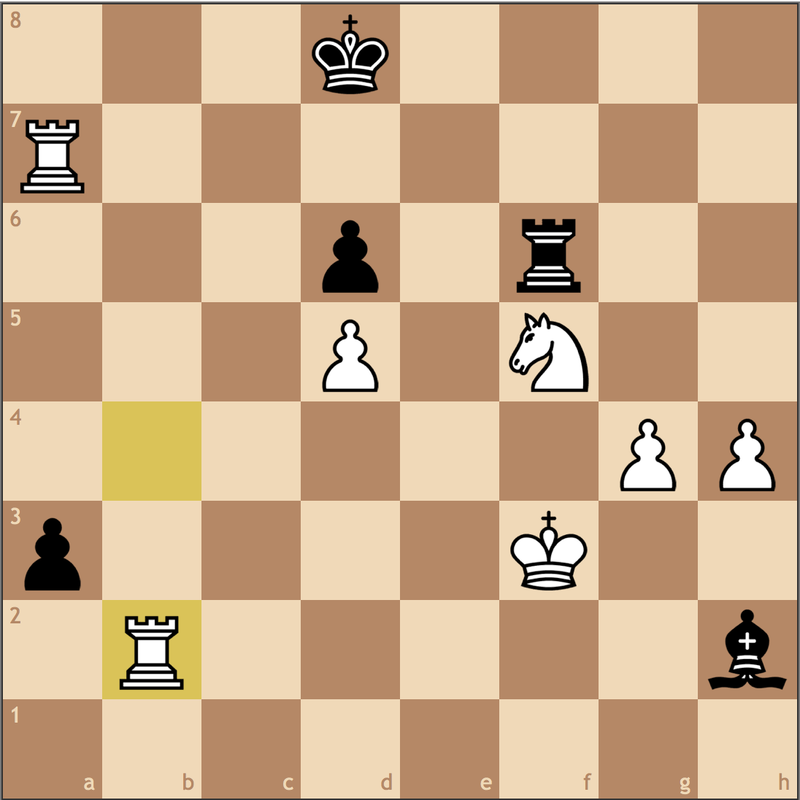 All endgames favor Black here. However, my opponent didn’t play this move when originally given the opportunity, so he must have thought the assessment was the same as before. 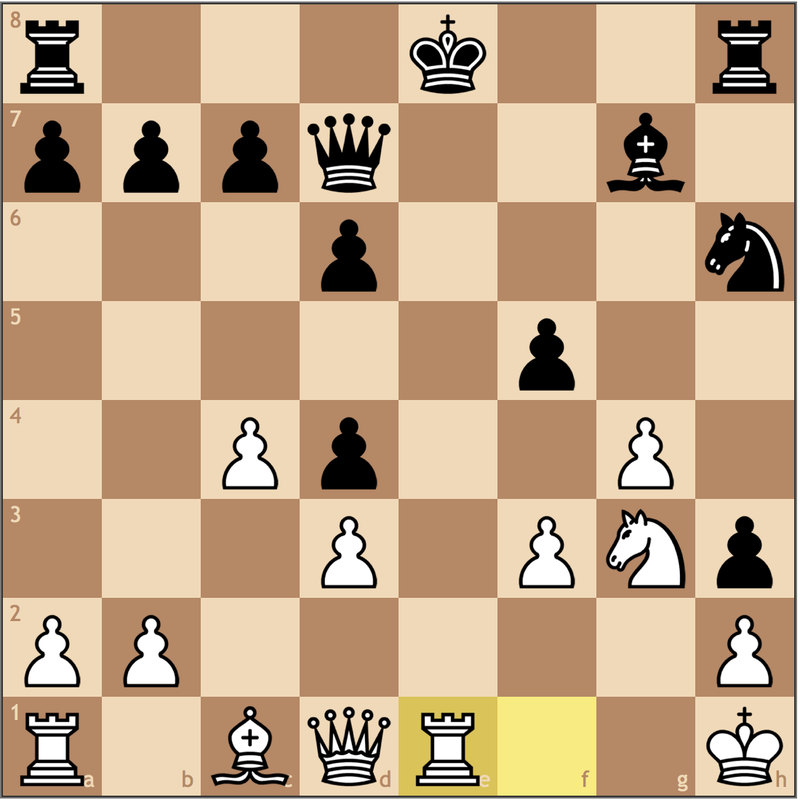 With evasive play, Black has avoided the loss of a pawn, but even after 18…0-0-0, my opponent will find his lack of development and counterplay concerning. My knight will find the f5 square, and my bishop, g5. 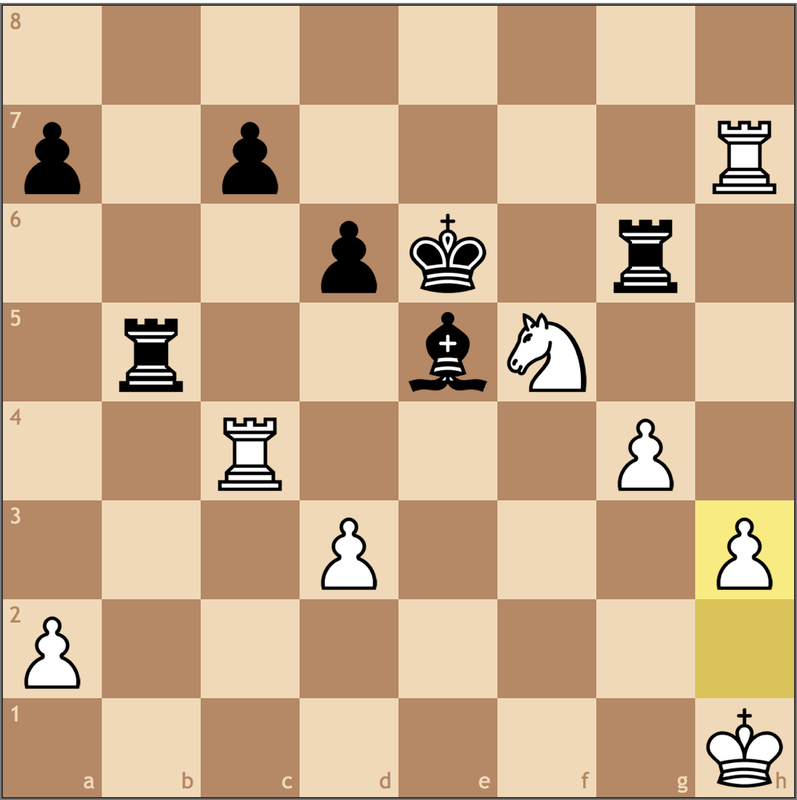 White’s position plays itself. The win still needs work, but you get the idea. 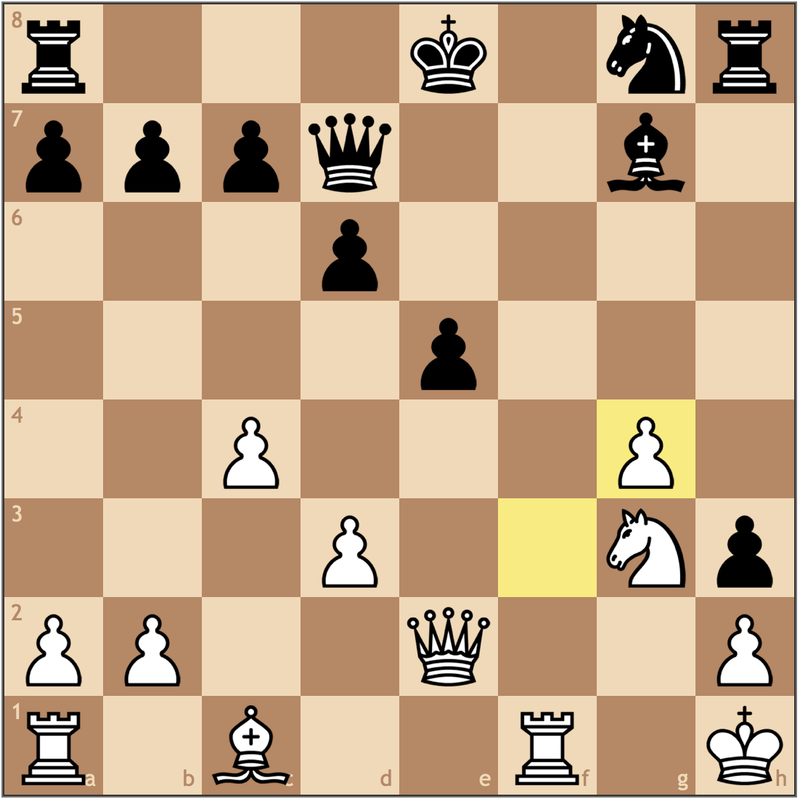 A trade on d4 eliminates Black’s ability to pressure the long dark squared diagonal, and opening the e-file will favor me. So my opponent, uncomfortable with his options, played a move I hadn’t considered. 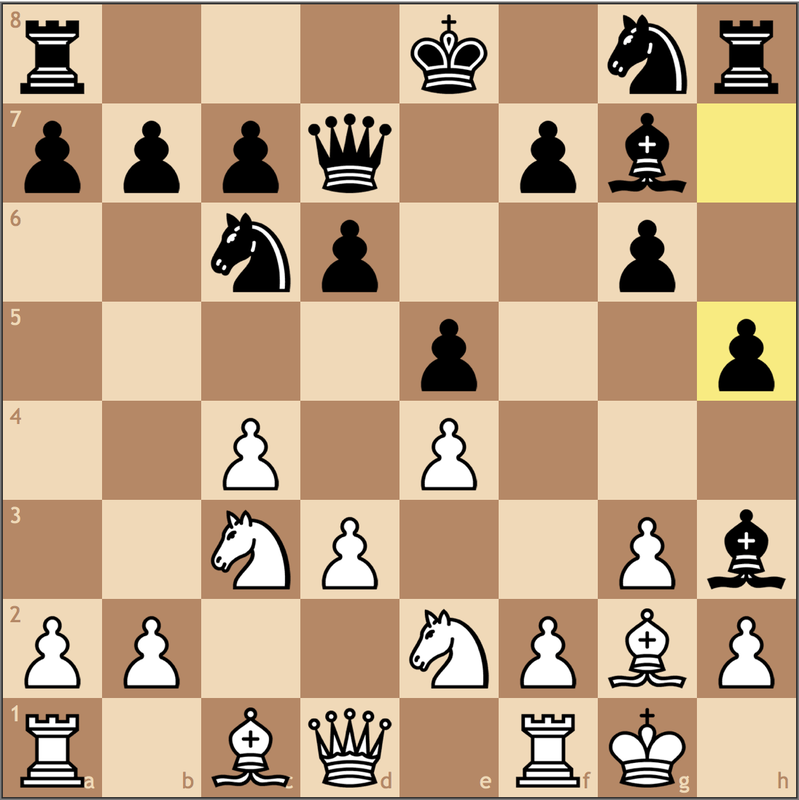 The idea that opening the long diagonal will give Black strong play. However, this is the first innacuracy of the game! 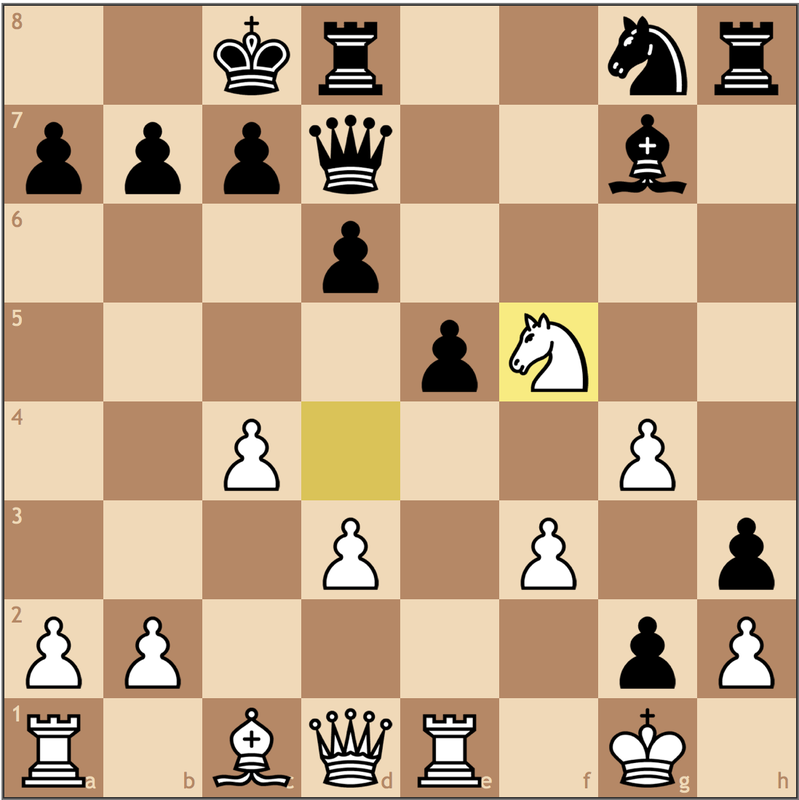 With this line my opponent forces me to seal in his bishop and open the e-file. The only way to refute Black’s play! In just a couple moves, Black will find himself much worse! Not only is Black unable to castle, but his knight on g8 is extremely immobile. From this point on though, Black’s 12. h3+!? starts to pay off as his pressure along the light squares becomes my biggest issue. The only move from Black that doesn’t concede anything. 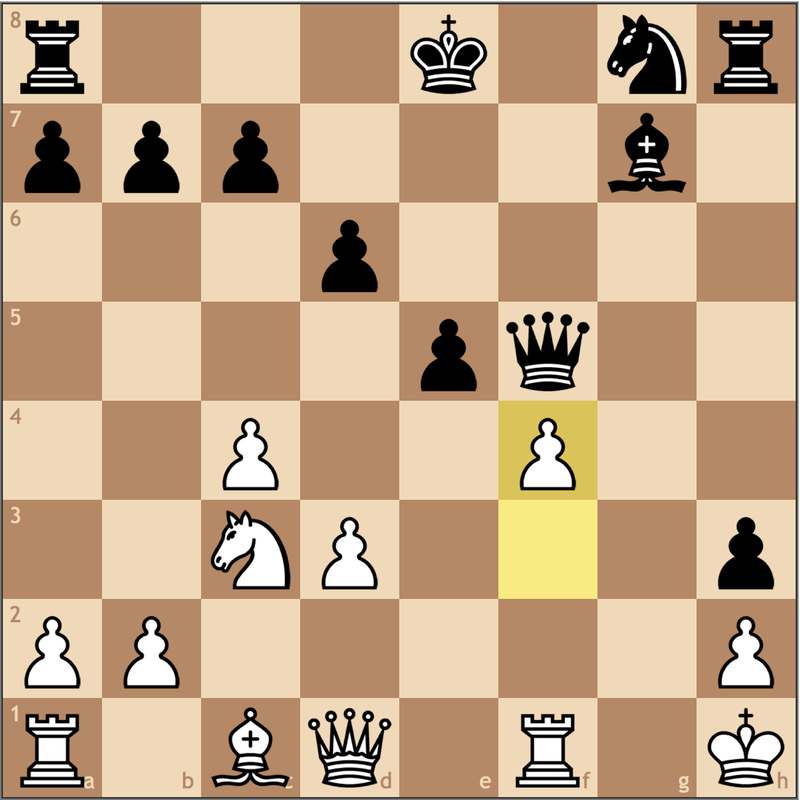 While the f7 square becomes weak, my rook can’t get there due to the pin on the king. With the queen cut off from the kingside though, I decided that now would be the best time to drive the queen away by force. 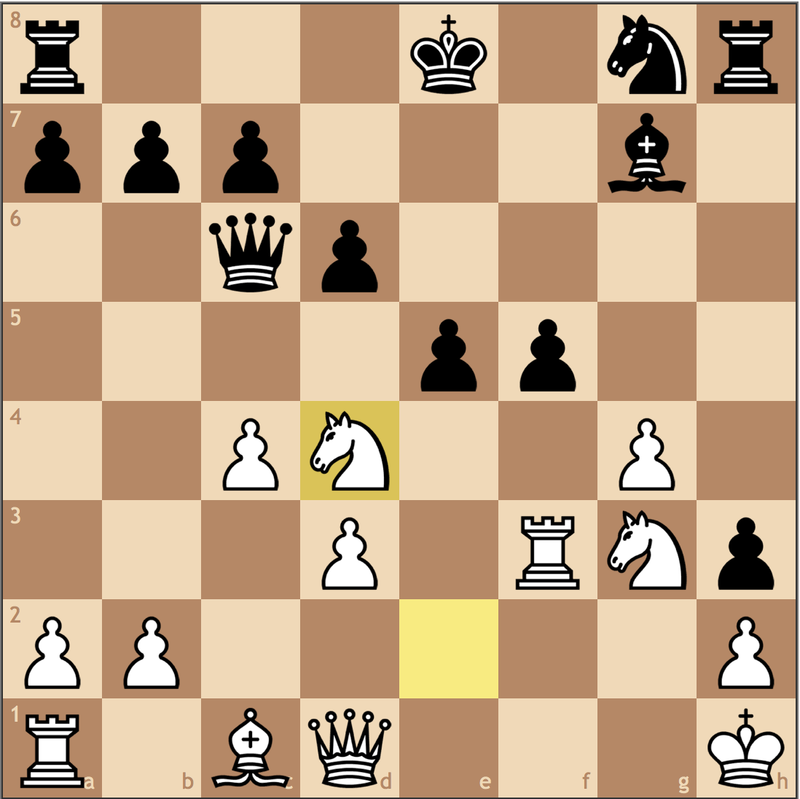 The best move if Black plays the continuation correctly. The idea is that regardless of what I do, Black’s queen can stay on the diagonal with the b7 (and potentially d5) square opening up. Without much to do, I made my next move, assuming my next move assuming my opponent was intending a pawn sacrifice. A critical mistake! 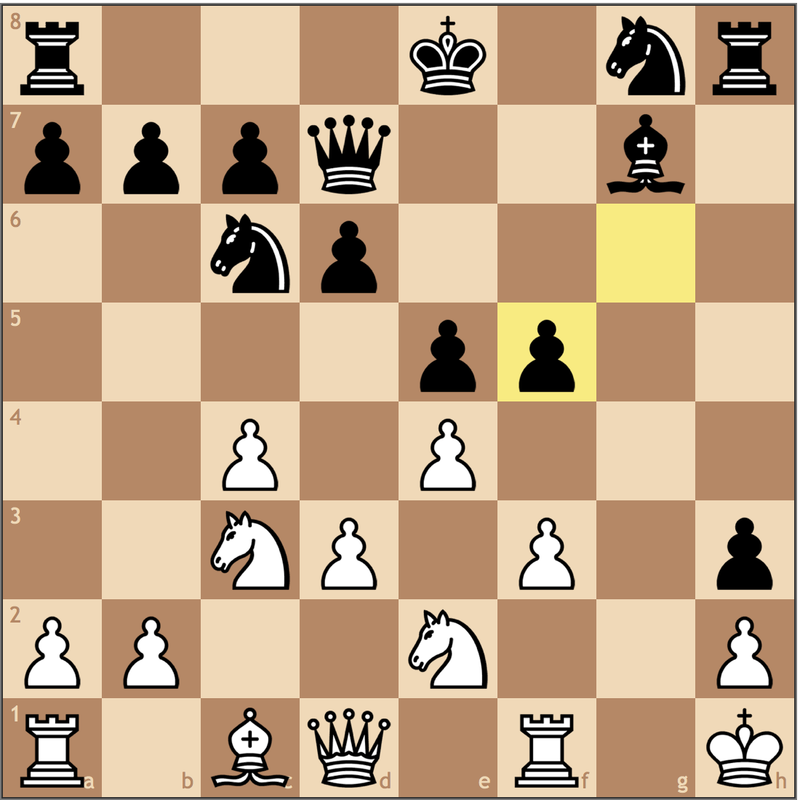 With this move, Black gives me an opportunity to move my queen away from the defence of the f3 rook, giving my a1-rook a chance to enter the fight. 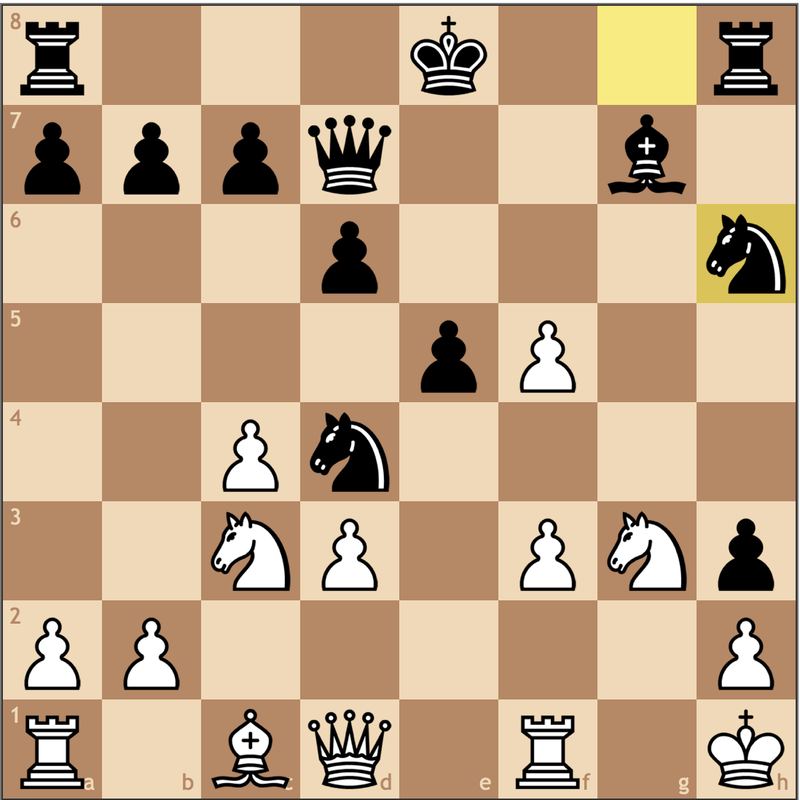 Black had much better in simply sacrificing the pawn and putting the queen in the center of the board. Black really needed to try 22… Qd5 to force me to play slower. 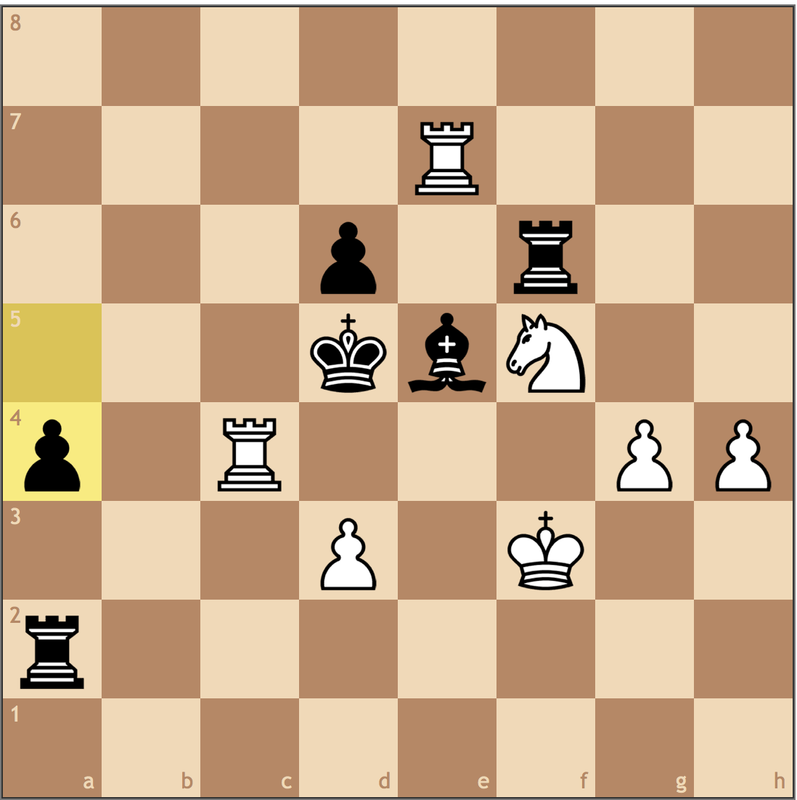 White’s plan would be to play Qe2-e4, trade queens, and go into an endgame with small winning chances. But with my next move, my opponent realized how active I had become. Poking at the f7 square while giving my rook on a1 a chance to play. The best defense. Using the other rook doesn’t pin my knight. A sample line I looked at was 23…Rh7 24.a4 Qb7 25.Rf1, but 24. 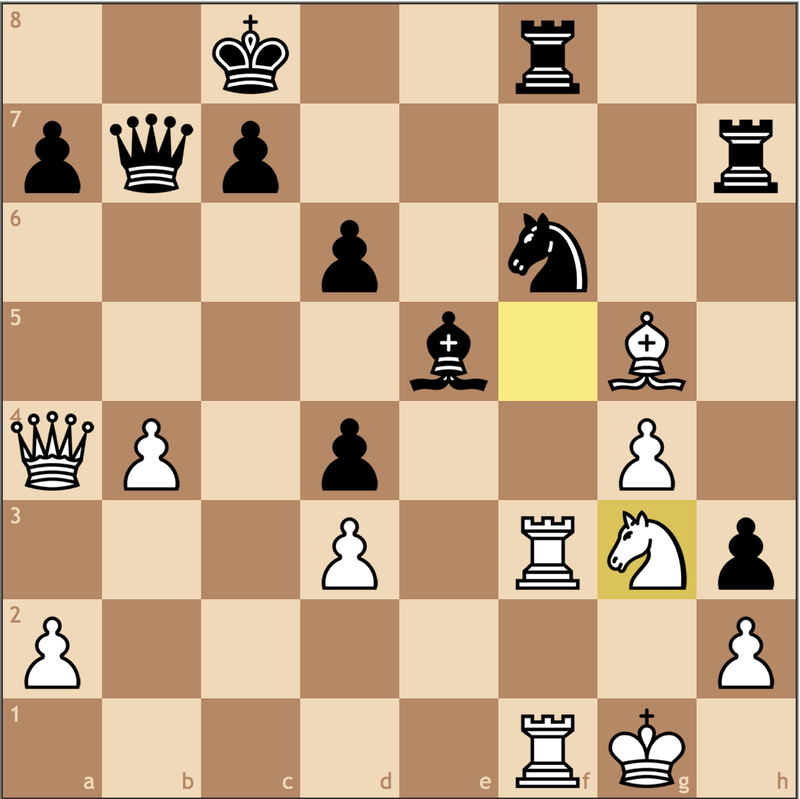 Nh4 also looked appealing, with the idea of going to g6, or bringing the rook down to f7. I hadn’t really decided since I figured the text move was far simpler for Black. 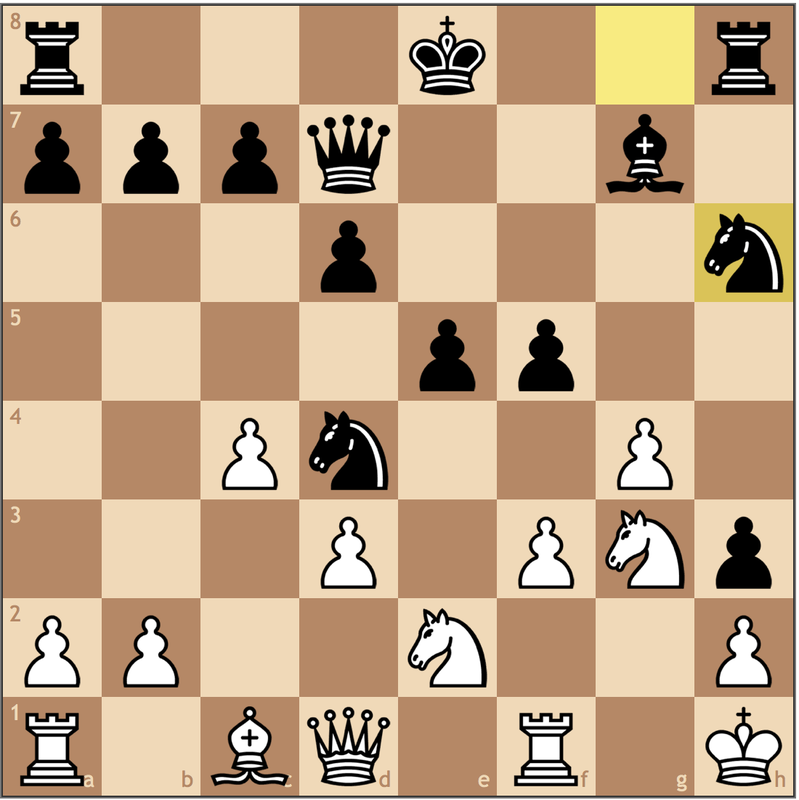 Here I thought I was being smart, forcing the queen to go back to b7 instead of c6 to pin my rook, however, Black actually is in no rush to do this. In the game, I thought 24… Nf6 25. 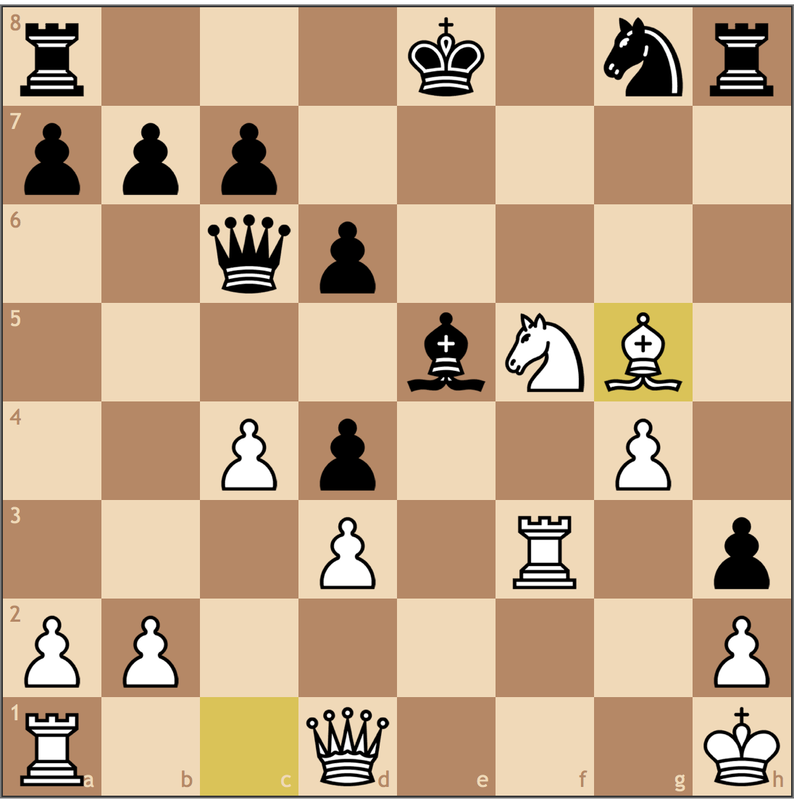 Ng7 was fine for White, putting pressure on e6, but 25… Nd5! was actually winning for Black. 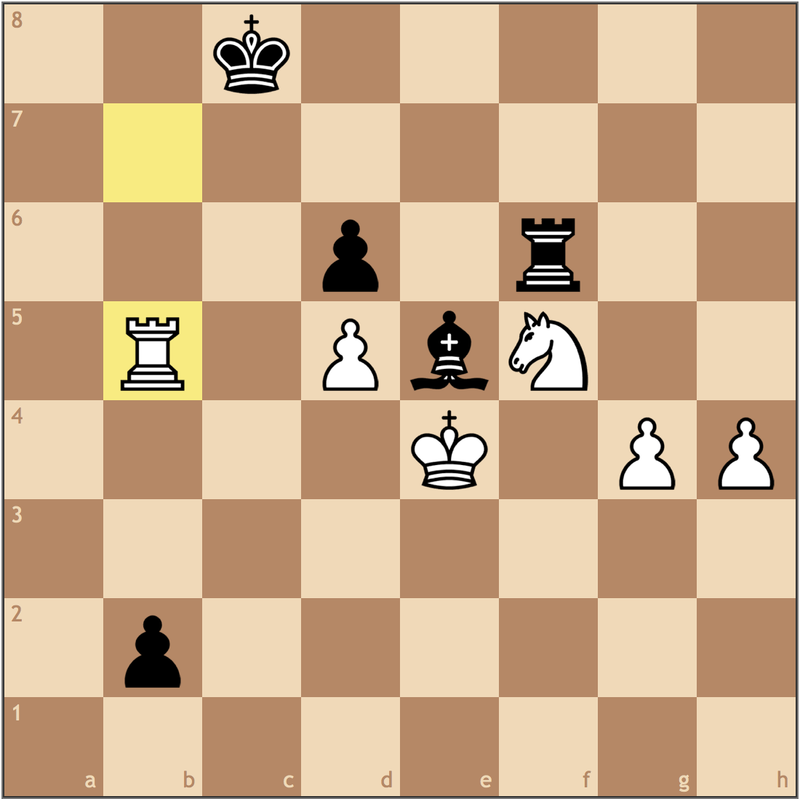 The computer says that after 24… Nf6, the position is about equal in other lines. 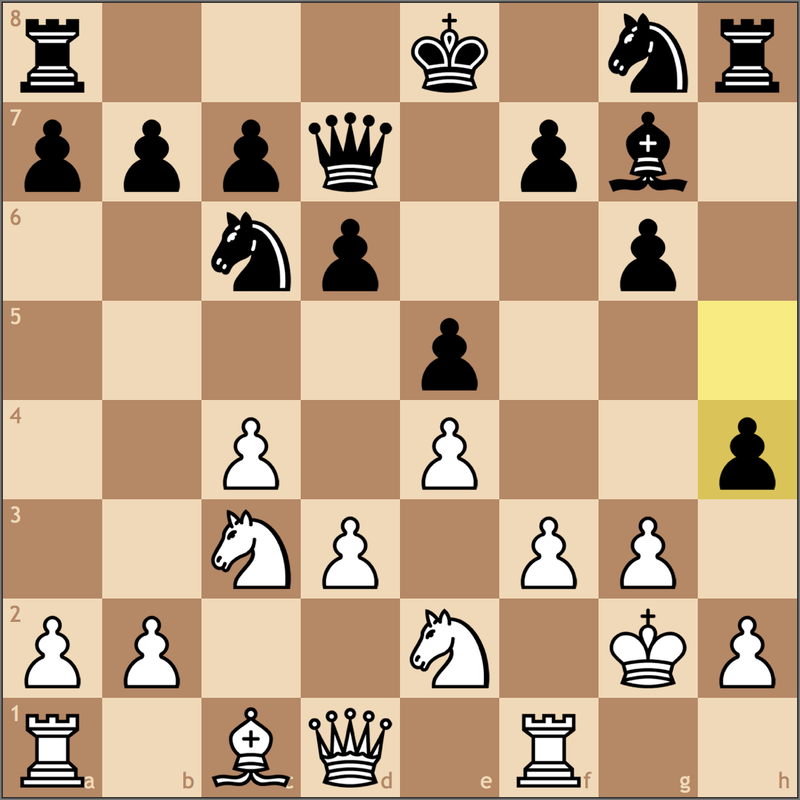 So why is it so important that White convince Black to reach b7 instead of c6? 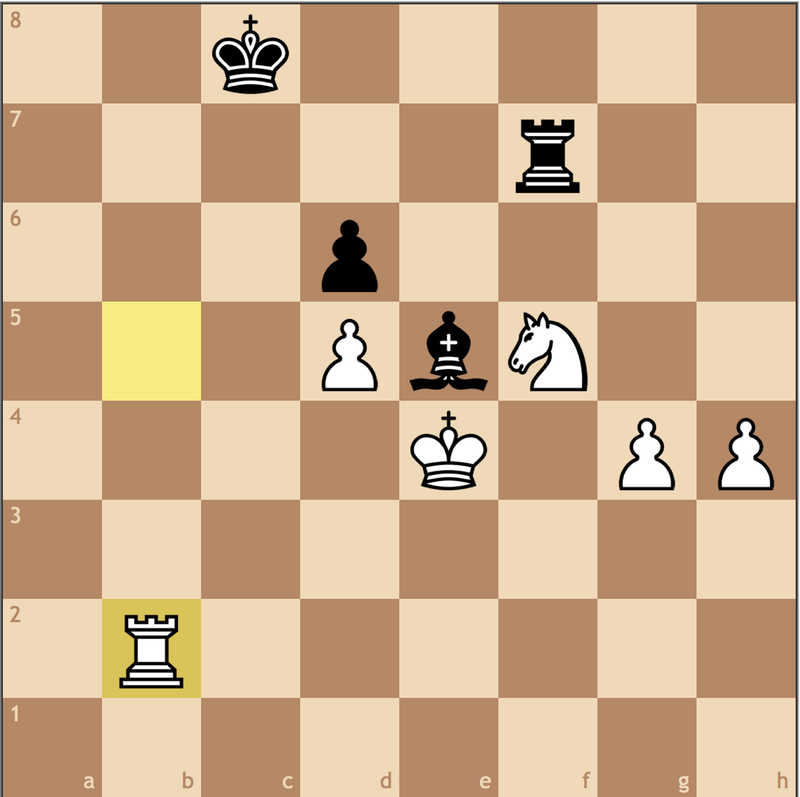 Well now White has Qa4+!, and Black is forced to surrender his control of the long diagonal. Black is becoming passive, and if he had tried 25… c6, not only does he block in his queen, but I also have a turn-around tactic in 26. Nxd4! winning due to the attacked rook on f8. It turns out that this simplification leads to equality since (as I soon discovered) the endgame is extremely difficult to convert. The computer gave me an option here that holds on to my grasp on the position with 26. Rf1 Rh7 27. Kg1 getting out of the pin 27… Nf6 28. Ng3 += with a slight edge. I do have to say, so far the game has been very complex, yet there have not been any missed tactics by either side. Coming from the position of strength, I have to say this is a testament to my opponent’s defensive resourcefulness to find holding moves each turn. 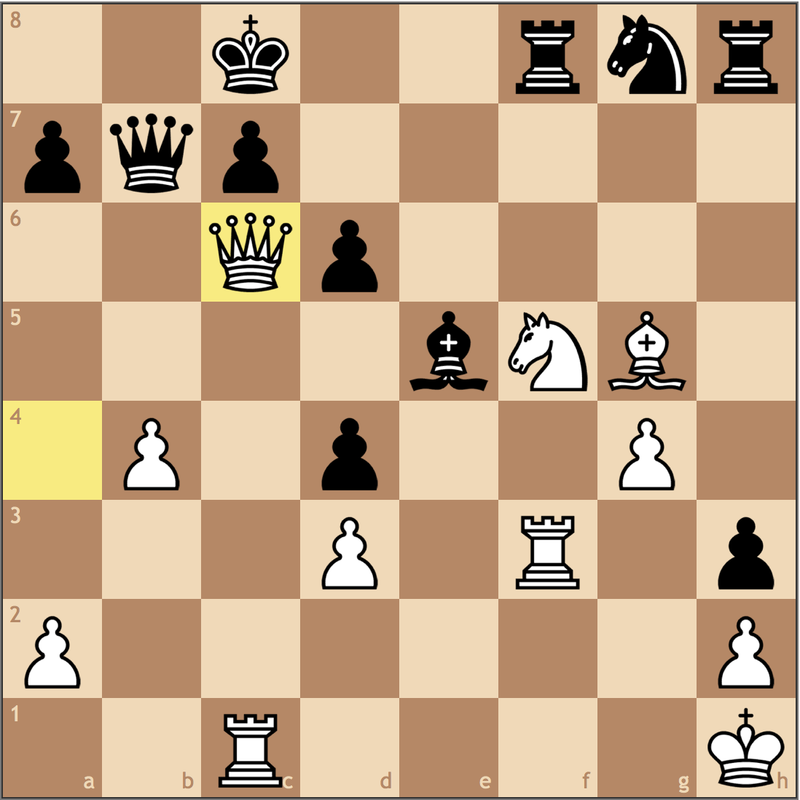 However, with the queen trade on c6, I must win again – this time however with an advantage on the clock. 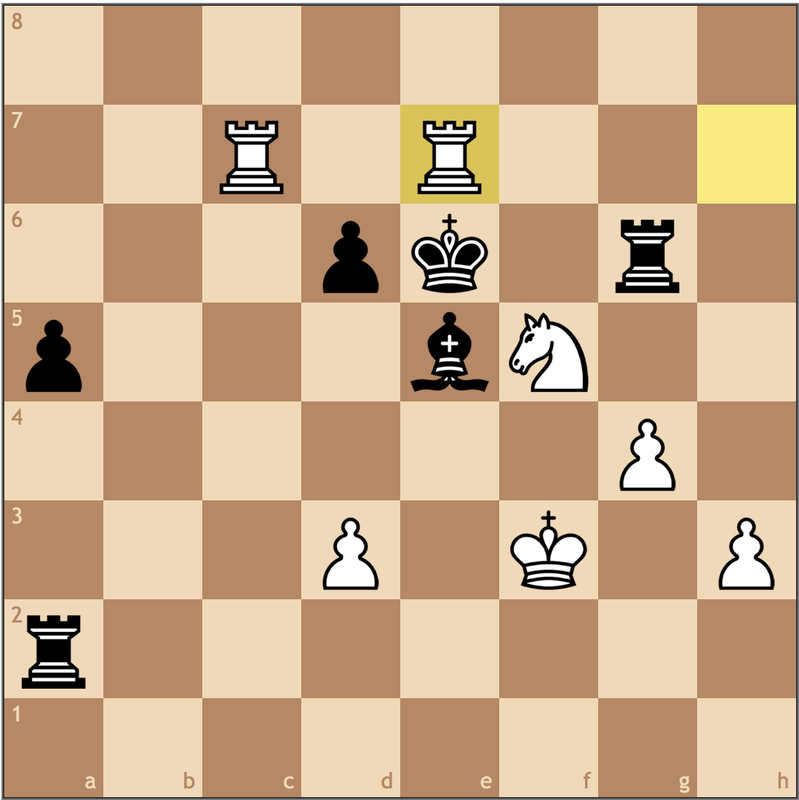 Stopping any future a- or c- pawn advances from Black. My opponent is cramped, but with his next move, he gives up a pawn for activity, which proves to be vital for his ability to play. 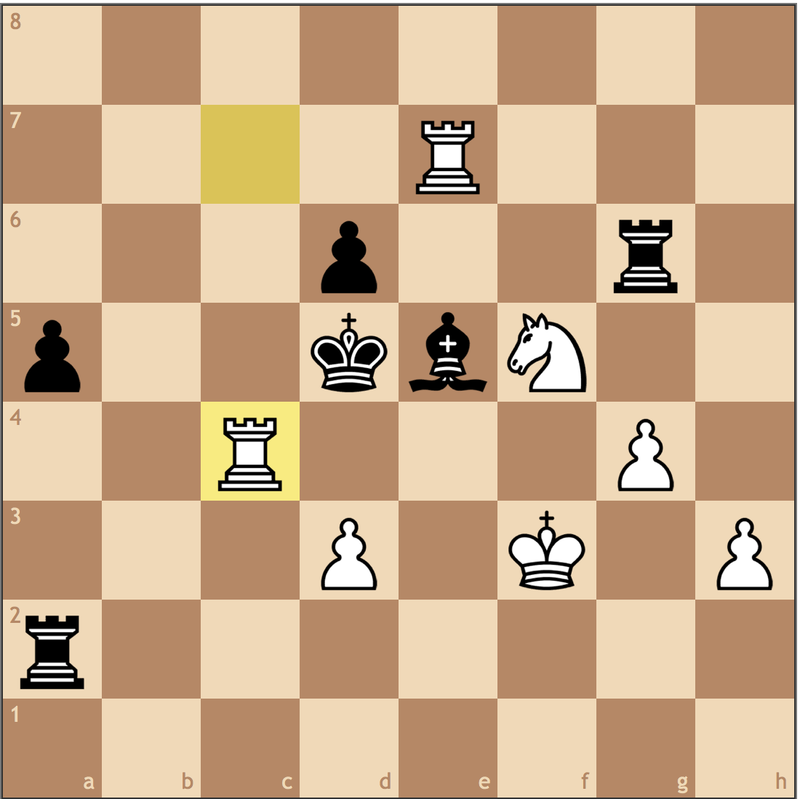 With pressure on g4, I decided I have nothing better than to win the pawn on d4. but to do this I must give up my bishop for a knight, and increase the Black bishop’s scope. 30… Rxf3 31. Nxf3 Rf6 32. Nxe5+ does not win a piece! Black can prolong the fight with 32… Ke6! 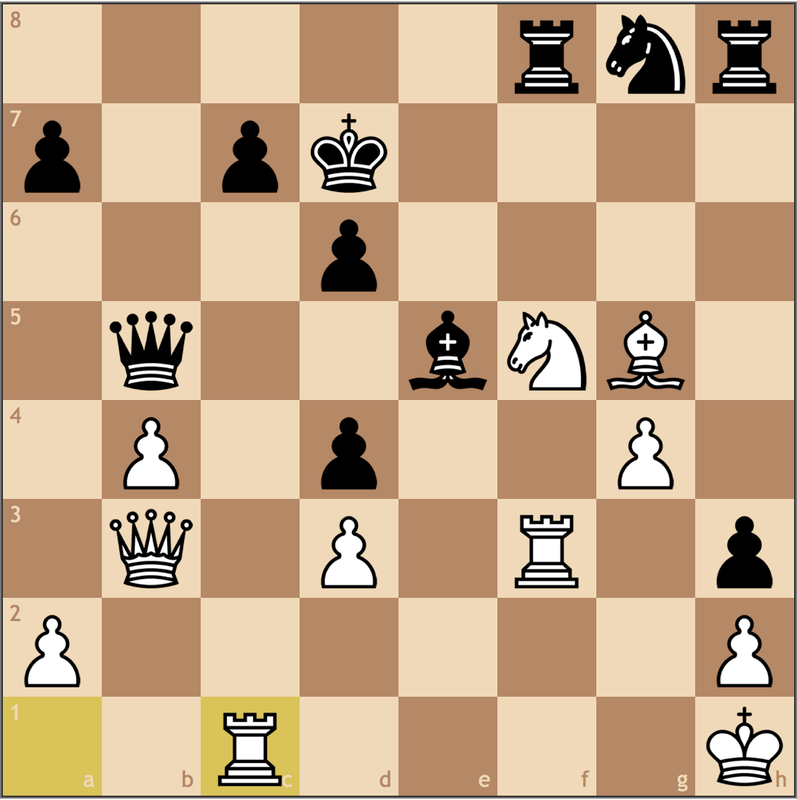 …and White must stop the threat of mate on f1 with 33. Kg1, meaning that this is the position that must be understood. 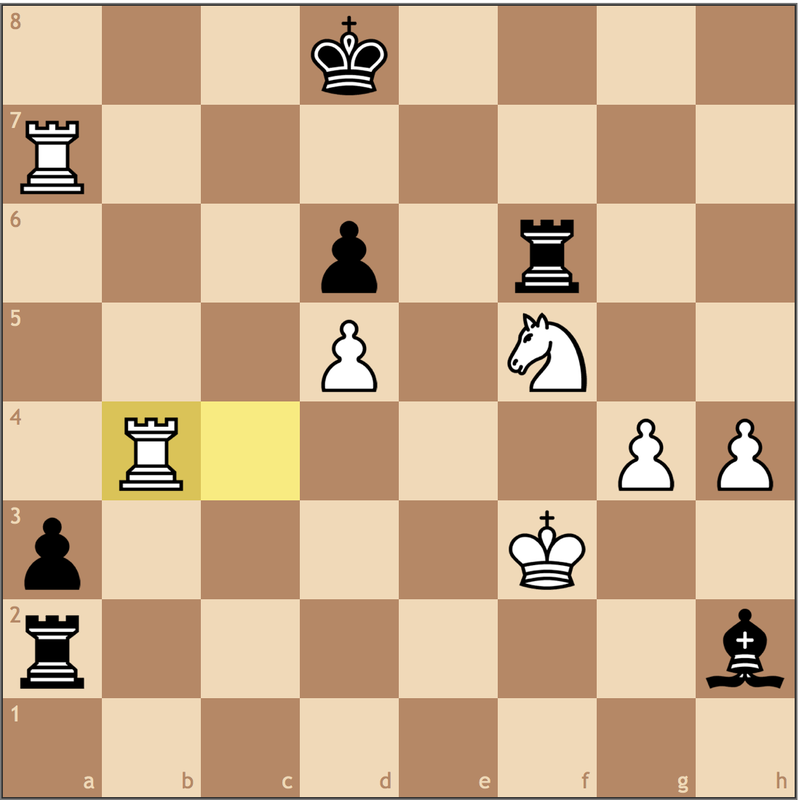 While Black may still be able to hold, I assessed that my advantage had increased since Black must give up the c7 and a7 pawns (the importance of a prophylactic measure like 28. b5!). Since I believed I had better winning chances, I was okay with this position. So simplification does not come to Black’s aid. 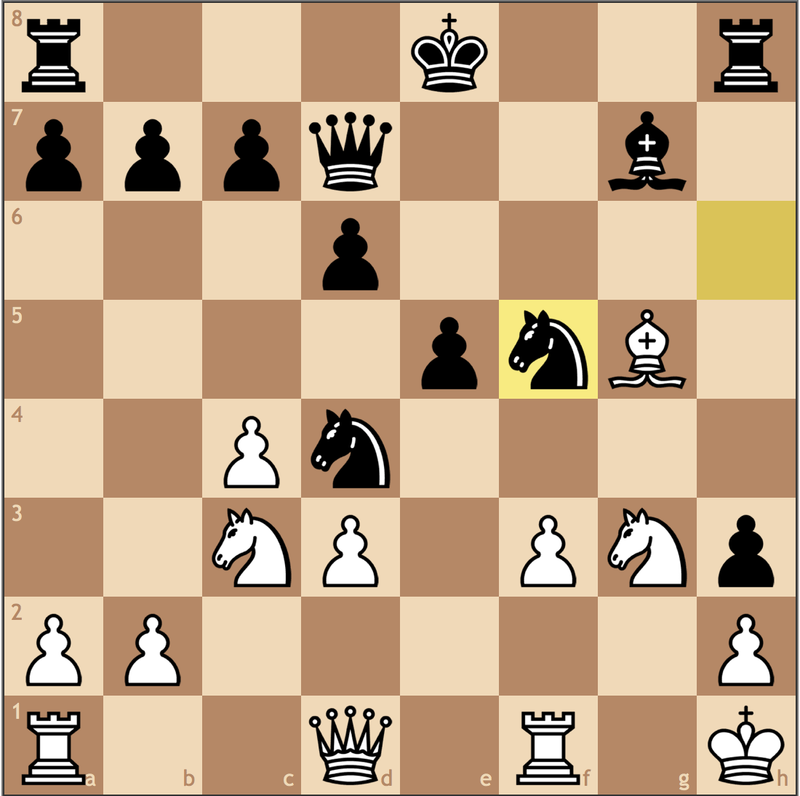 Black can’t afford to be passive either since the backward 30… Rhh8? has a tactical problem. Can you find it? Here I had found 31. Rxf8 Rxf8 32. Rxc7+!! since now 32… Kxc7 is met with 33. 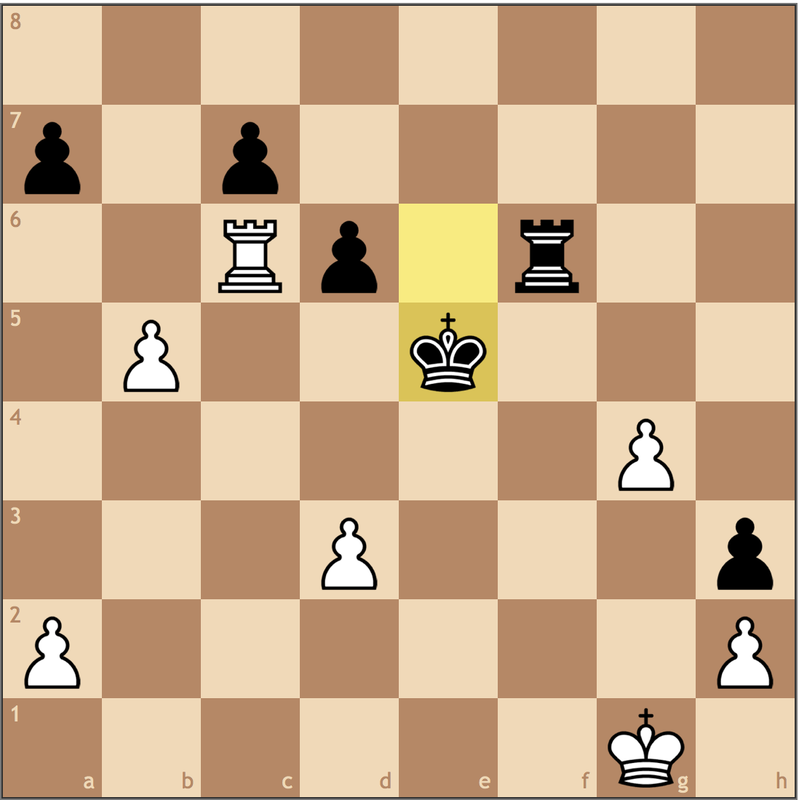 Ne6+ with a winning minor piece endgame. 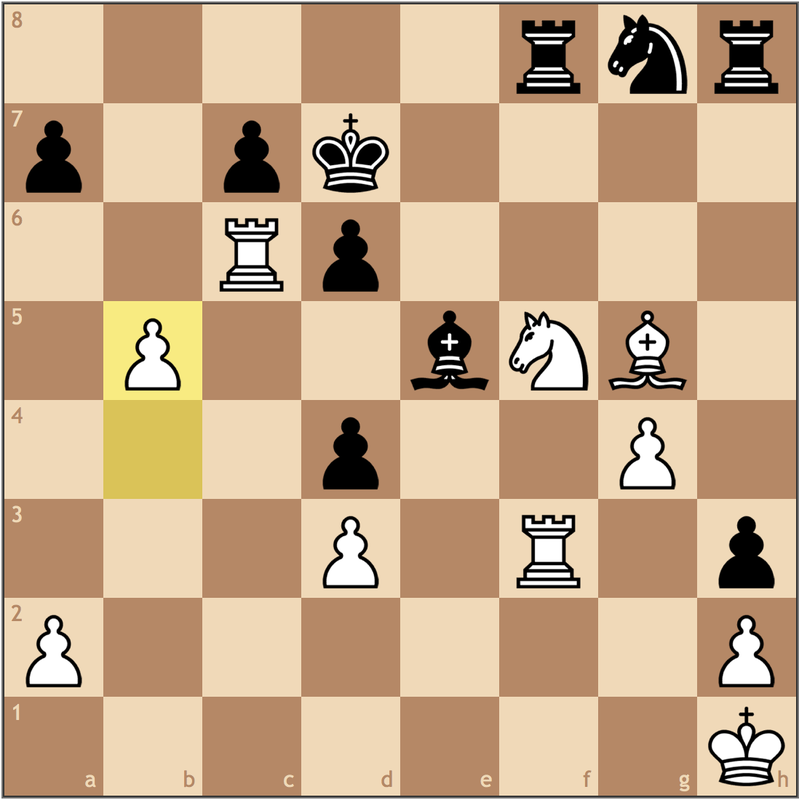 Black can’t save himself with 32… Ke8, threatening mate on f1 and the knight on d4, because 33. Rc8+ forces a trade of rooks, and now I must find Nd4-f5, followed by d3-d4 to limit Black’s ability to attack my h2 pawn. It’s clear that only White can be better, and of course I knew my opponent wouldn’t go for it. There was one last option I didn’t consider until after I had made my move in 30… Bxd4?! the concept being that my king is stuck on h1 and the constant threat of mate is a problem for me. While this may be a potential drawing resource in other positions, my b5 pawn makes c7 a permanent backwards pawn and target. So in the line 31. Rxf8 Re6 32. 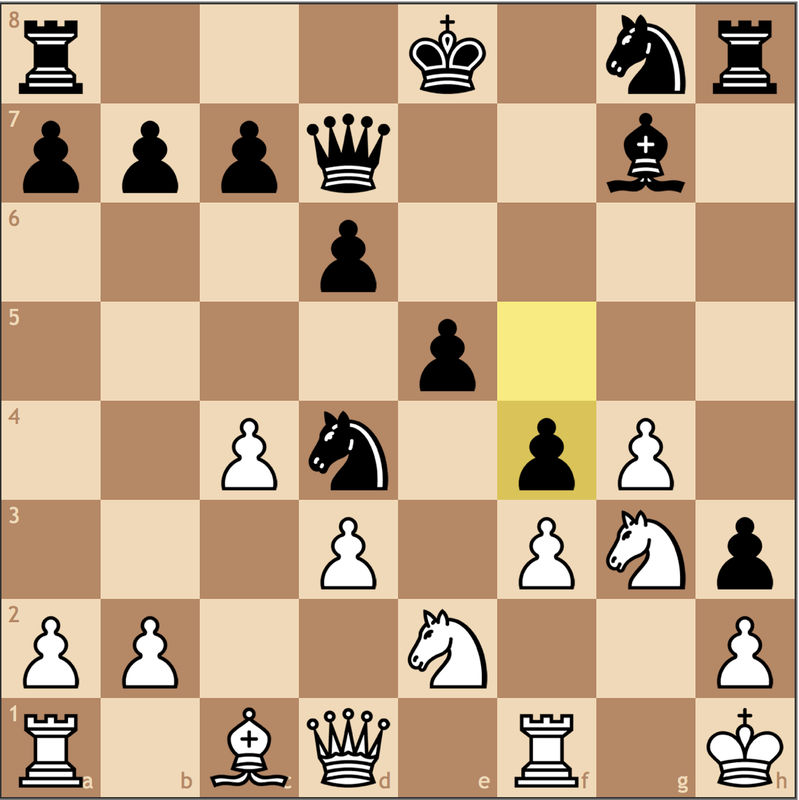 Rc1, Black cannot both be active and defend c7 as 32… Re3 33. Rf7+ still gives White reasonable winning chances. But as I said, I thought my opponent found the most aggressive try despite his time troubles. My knight will return to f5 to block the f-file, after which Black can pressure the g4 pawn and emphasize my king’s awkward positioning. The second real mistake from my opponent (the first being 22… Qxb5). Time trouble played a large role in this decision, and now my not only will I eliminate Black’s annoying h3 pawn, I will get a rook on the 7th! 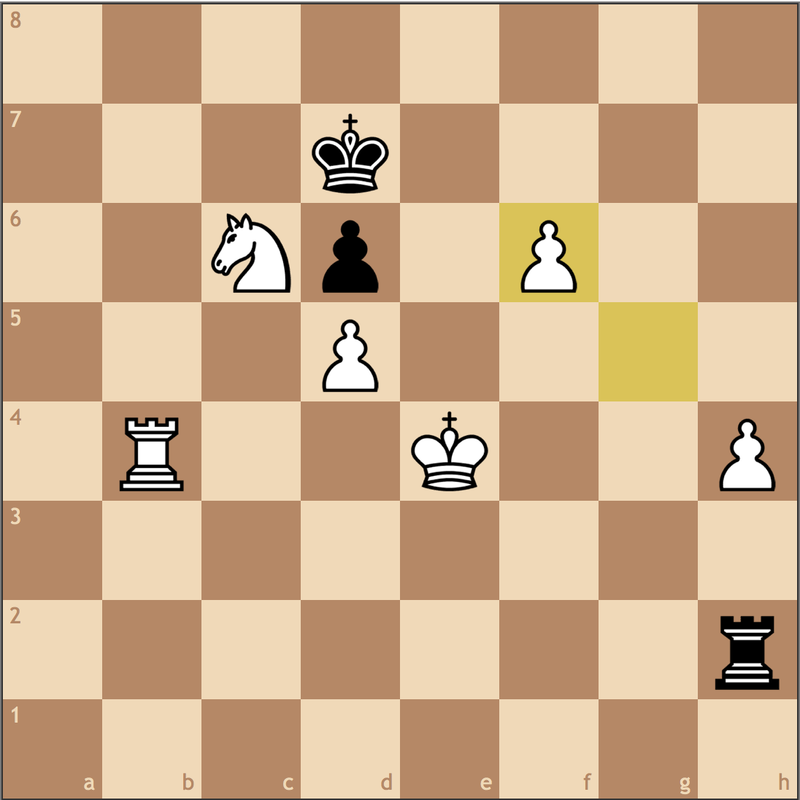 And while Black remains a pawn down, he has reasonable drawing chances. Having a bishop in the center of the board alone should be enough compensation for the extra g-pawn, not to mention, my queenside stucture is also quite hideous. 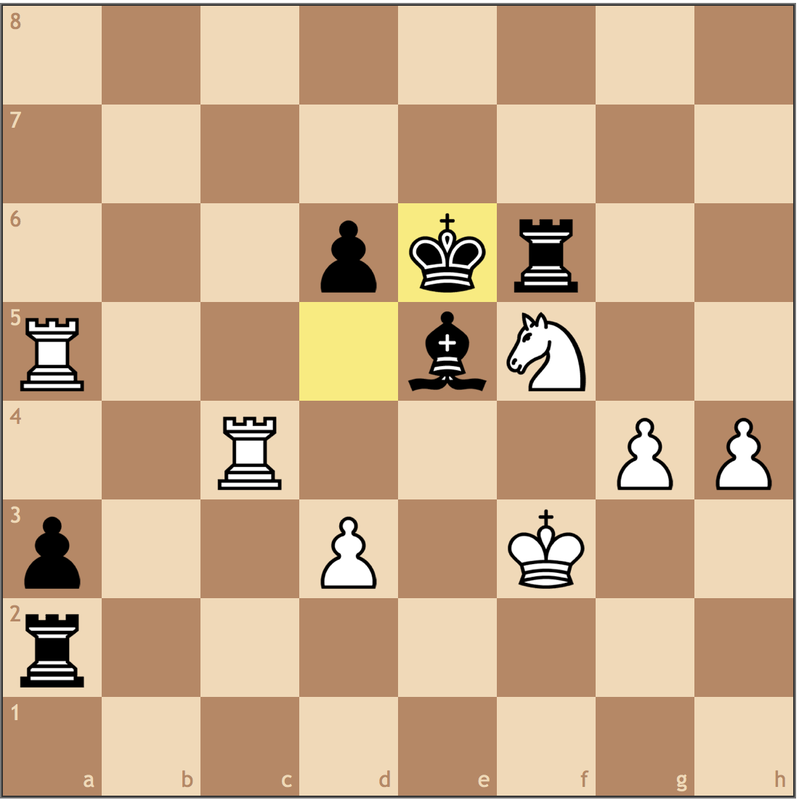 Rather than immediately grab the c7 pawn, I thought it was important to nurture my two pawn advantage on the kingside. 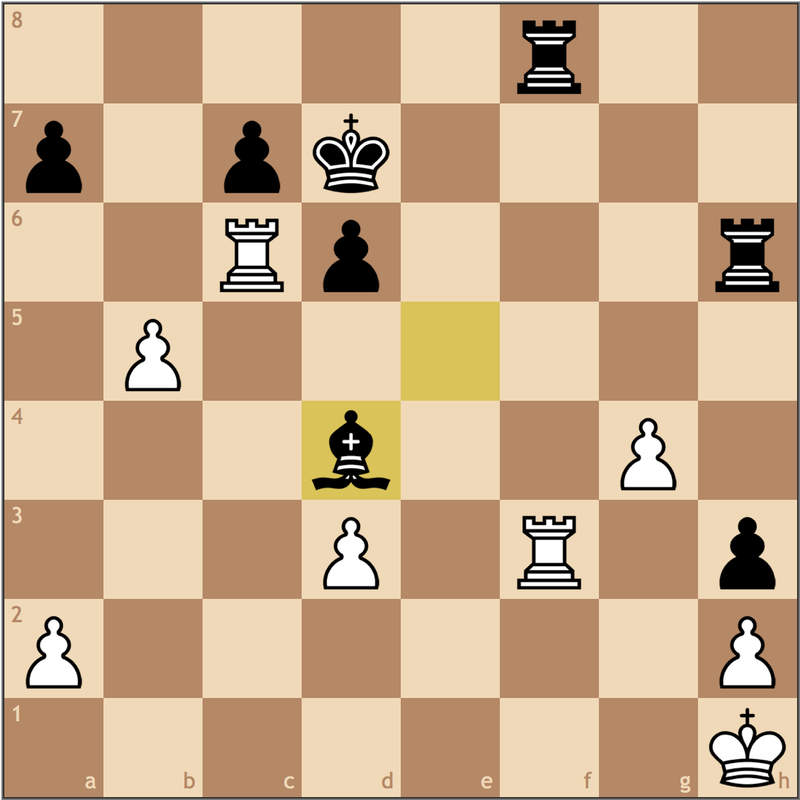 If Black tries 35… c5, I can play 36. a4, and only Black’s b5 rook is truly active. Two rooks on the 7th and my opponent in time pressure? Should be an easy win, right? Not so clear. 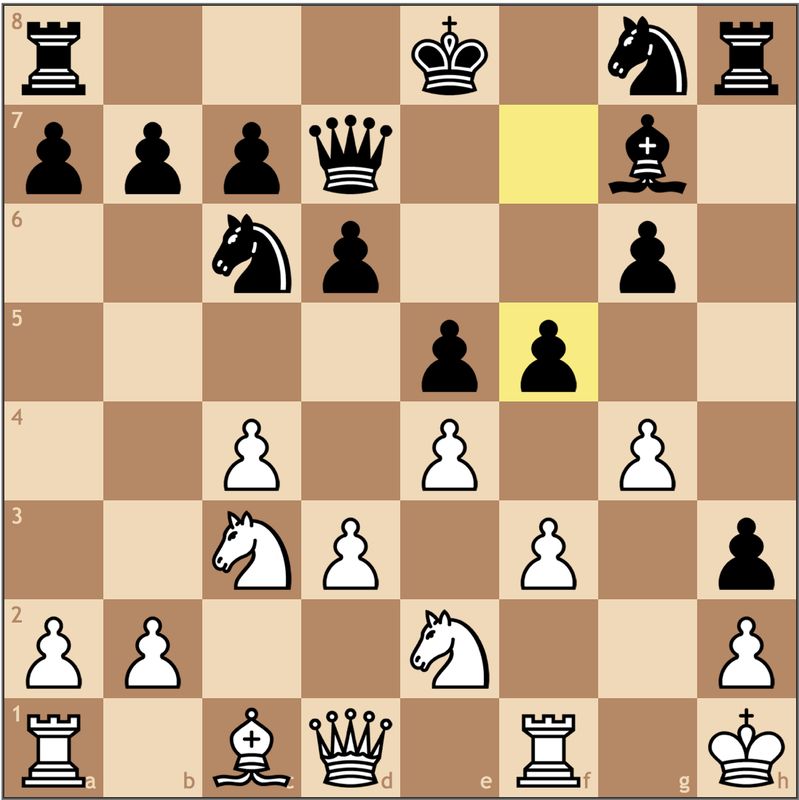 It’s hard to secure control of the d5 square (If Kf3-e4, …d6-d5+ wins for Black), and Black does have an outside passer. Believing I was winning since at the time I thought 39… Kd5 was unplayable (you’ll see shortly). I had calculated 39… Kf6, and now since the f6 square cannot be used by Black’s rook, my idea was Ng3-e4 creating a mating net while improving the overall position of my knight (I was fine with a bishop and knight trade since the resulting rook and pawn ending should be won). 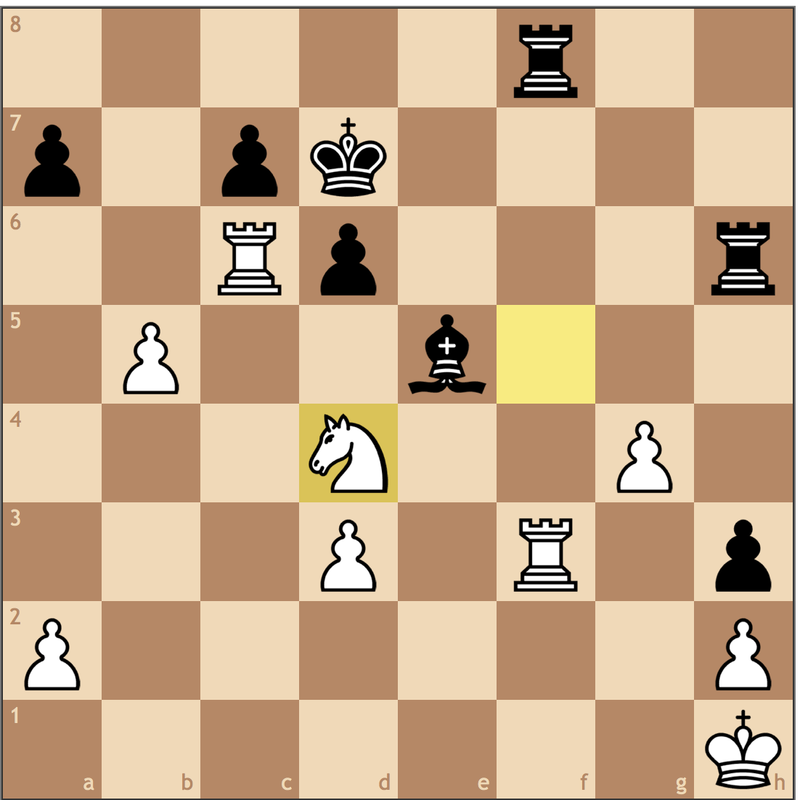 My opponent played his move quickly, so when I dropped this and his head sunk, I thought I had won because of my mating mechanism of Nf5-e3#. Here I got up walked around to wait for the resignation but had completely had missed my opponent’s defense. I give this move an exclamation for its psychological importance. With this oversight, I had now walked into a position I hadn’t analyzed and it felt like again, I had to start all over to win. However, with my opponent in time trouble, anything could happen so I made a waiting move. Black’s third mistake of the game. 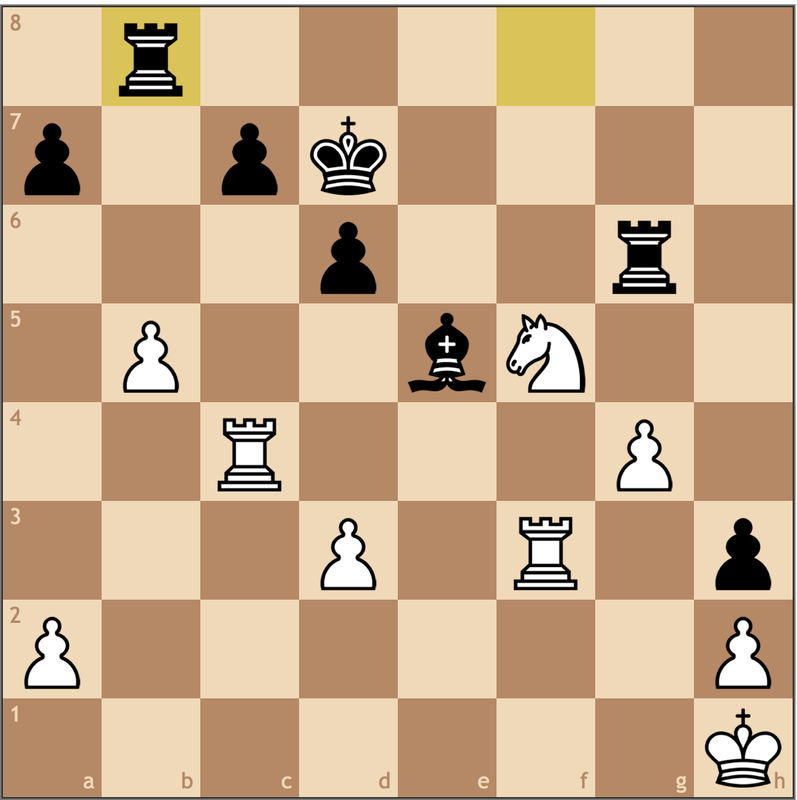 Advancing the a-pawn to a4 gives me a free tempo move with 42. Ra7, which is winning in all lines. Black should have also waited, but in time trouble this is hard to do, especially with my kingside pawns moving down the board. Finally, it’s starting to come together. Now with the king no longer on the fifth rank, I can play d3-d4, highlighting the awkward choice of squares Black’s bishop has. Missing the simplest win in 47. Ra8+ Kd7 48. 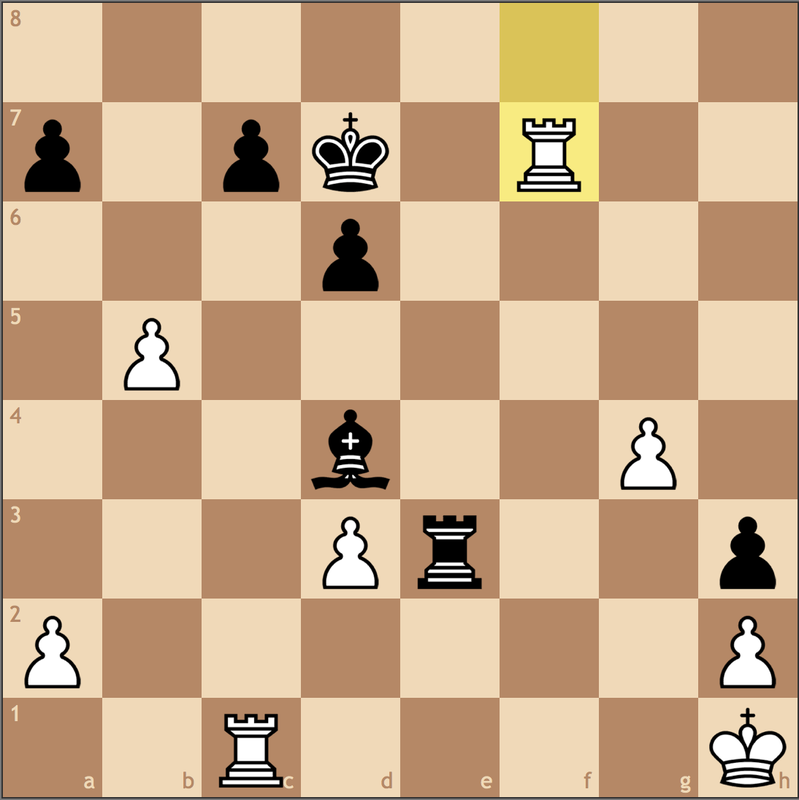 Rac8, and Black must give up an exchange to stop the threat of Rc4-c7#. But at this point I was already playing my opponent’s clock – with 8 seconds left, he can never hold this, right? Here I thought that my opponent could make no progress with the b2 pawn, but with it on a dark square, his bishop can hold it until the rook comes to the rescue. So as I promised, one blunder… moral of the story? Don’t look at your opponent’s clock! If I had just spent 1 more minute, I would have realized that 48. Rxb2 allows too much play and that 48. Rba4 is a lot simpler. 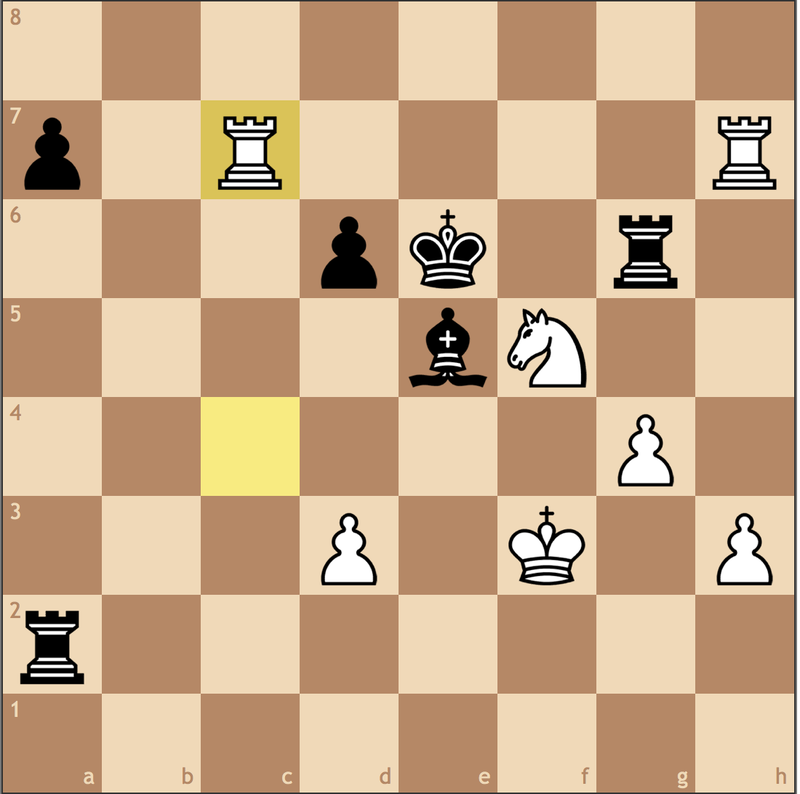 Thanks to the fork on d6, my rook is untouchable, so the endgame is now won. I can’t really blame my opponent for his mistake, but what I can say is that the mistakes will come if your opponent is in time trouble. Imagine how much less trouble I will be in if I hadn’t taken on b2! Here my opponent resigned after realizing my rook is protected on b4, and my f-pawn is soon queening. Tough game and my opponent did well to hold, but he simply just made more mistakes than me. Early attacks mean neglecting development. Sometimes the best defense is to find ways to punish your opponent for not following the fundamentals. Captures aren’t a truly forcing move. 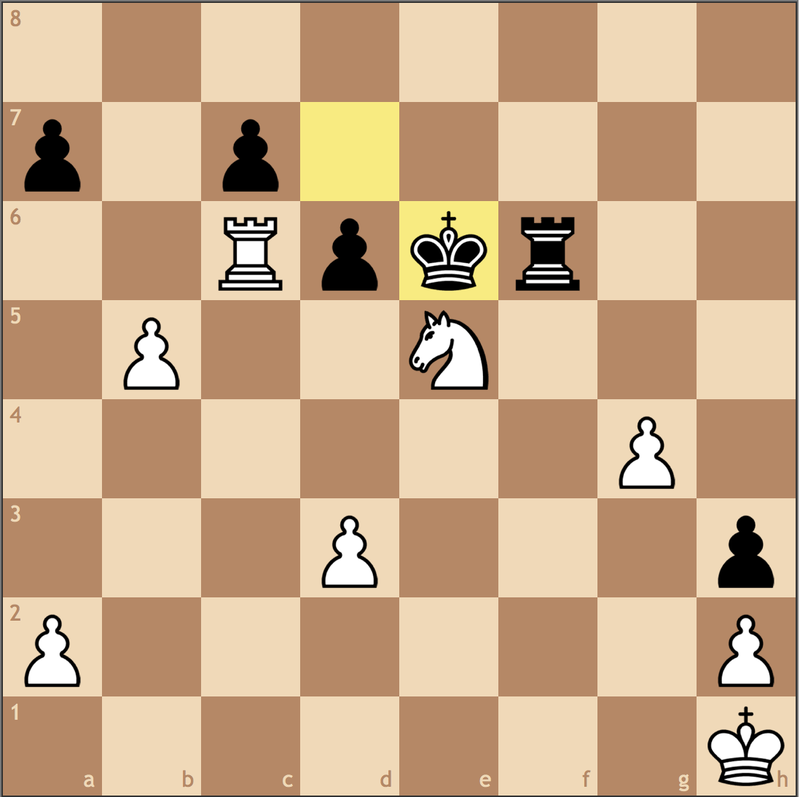 In this game, there were two points where a pawn takes pawn move could be ignored, and thus change the entire evaluation of the position. This brings me to my next point, always evaluate who is statically better each position. This constantly changed throughout the game, so it changed the focus for each player’s goal as well. Time trouble for your opponent is not time trouble for you! Say what you want, but I’m going to kick myself for this Rxb2 move more than I’ll pat myself on the back for winning. Next time I won’t be so lucky. I thought this was a really interesting game, and I hope you did too. For me, winning (despite some errors) was a great way to rebound from the Pittsburgh Open and start thinking about my summer calendar – specifically the US Junior Open!